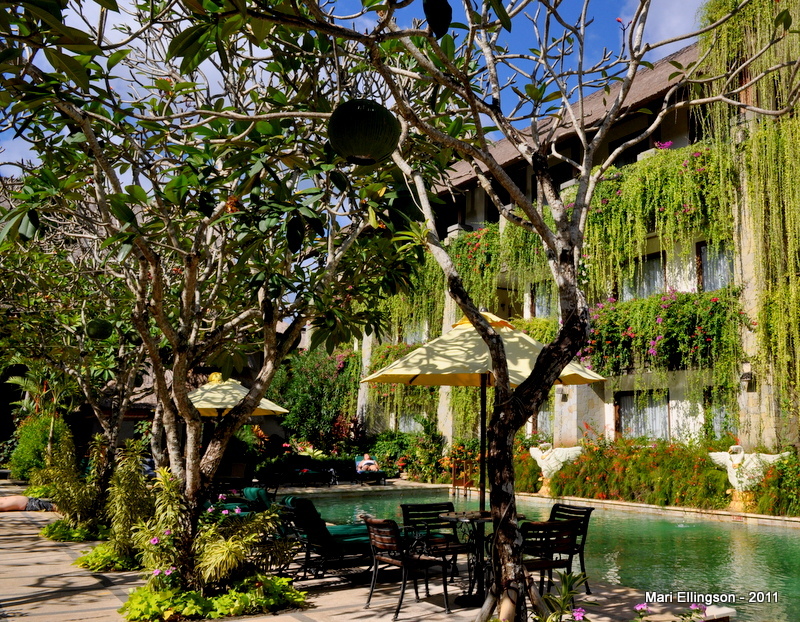 The north side of the Melia Hotel Bali. The grounds were so quiet and beautiful. 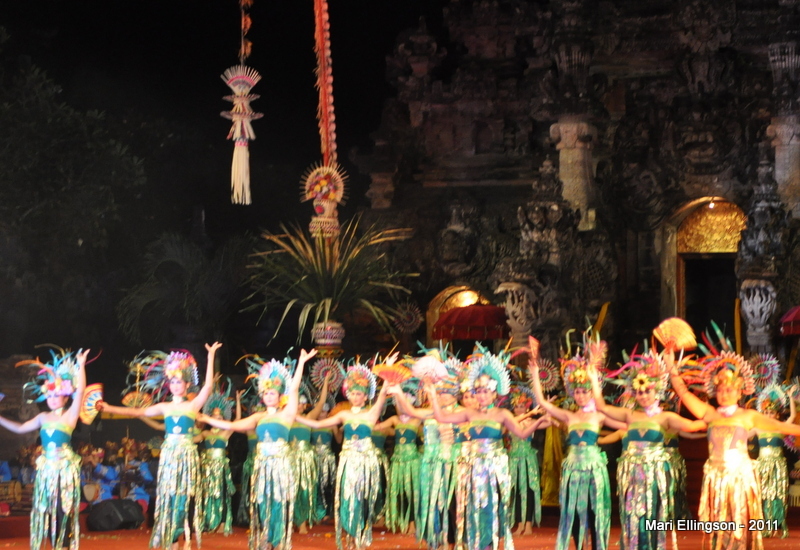 This is the second post on my visit to Bali last June – a year ago. My, how time flies. 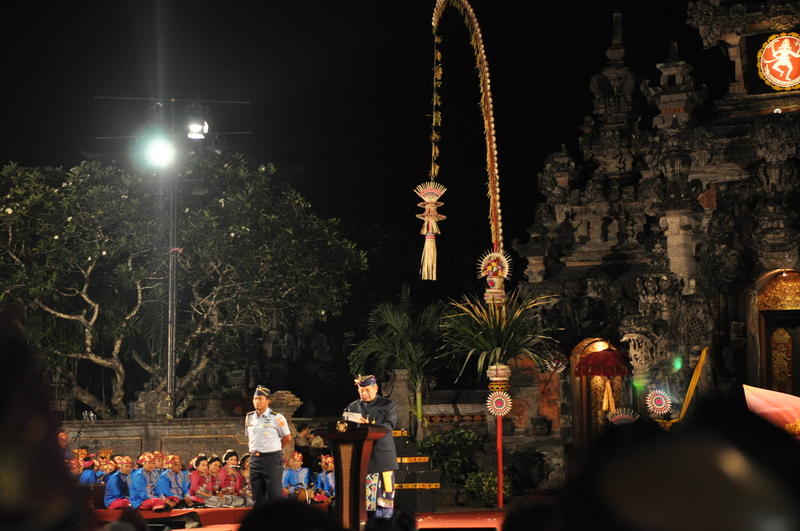 On Friday evening (on the day we arrived in Bali), we were told that we have been invited as participants to the regional meeting to attend a cultural festival which will be opened by The President of the Republic of Indonesia. 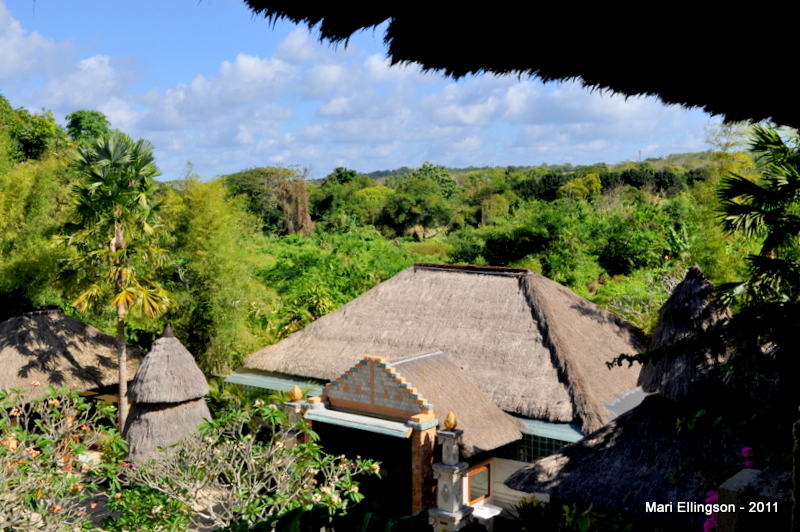 This was news to us as we were not told earlier when we checked into our hotel – the Grand Bali Nusa Dua. We also had not received copies of our programme in Bali for that weekend apart from attending the inaugural Global Ethics on Tourism meeting at a neighbouring hotel. 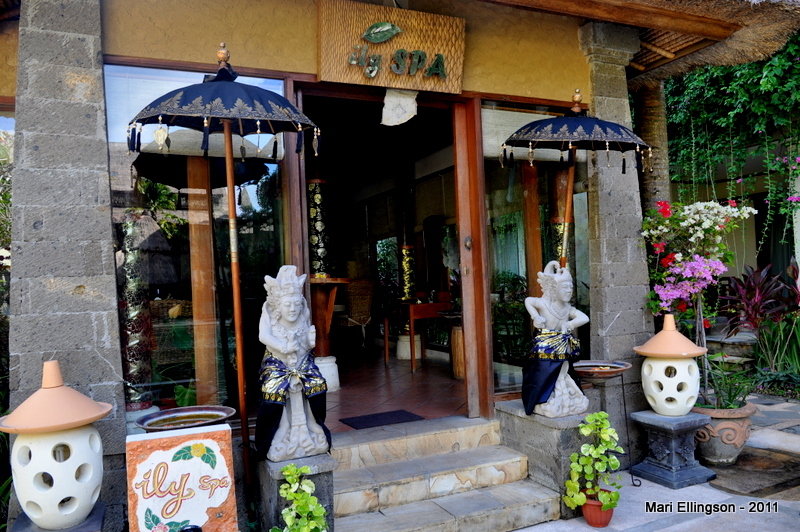 We only found out when we sauntered into the Melia Hotel Bali about 4.00pm or thereabouts. This hotel was the location of our regional meeting the next day, Saturday. The announcement that we were going to a cultural festival that evening was really a surprise and a half! 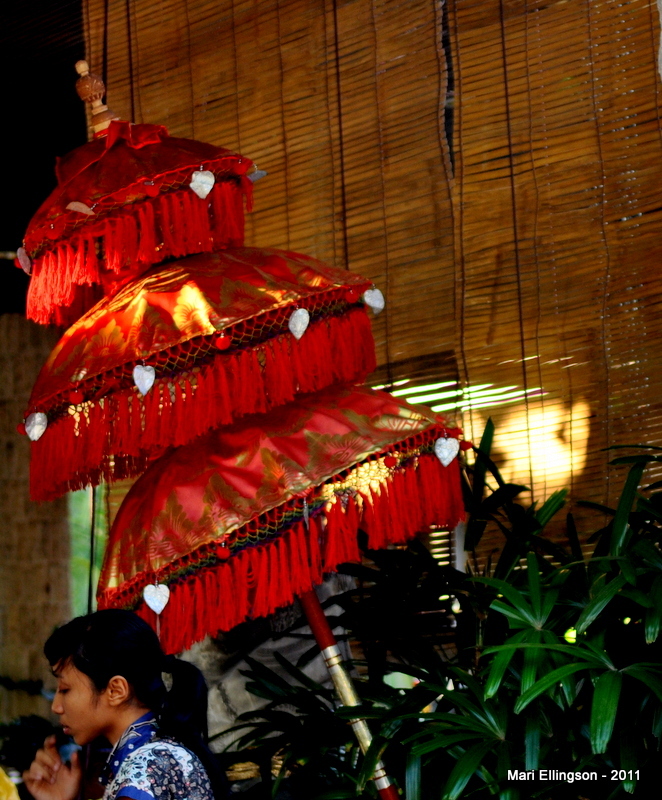 Entrance to the Melia Bali – the gong seems to be a common feature in most Balinese and Indonesian establishments. They use it to announce the arrival of an important visitor. Thank goodness we are from Papua New Guinea which has a blessed word-of-mouth culture and are not so hung up on a written programme so we had no problems as we switched on to our coconut wireless and asked around to find out what we were supposed to be doing. One thing we realised we had to do was wear something decent and dignified as we were going to be in the presence of so many VIPs and in a manner speaking we too were VIPs that evening at the cultural festival. We scrambled to find suitable attire for the occasion. 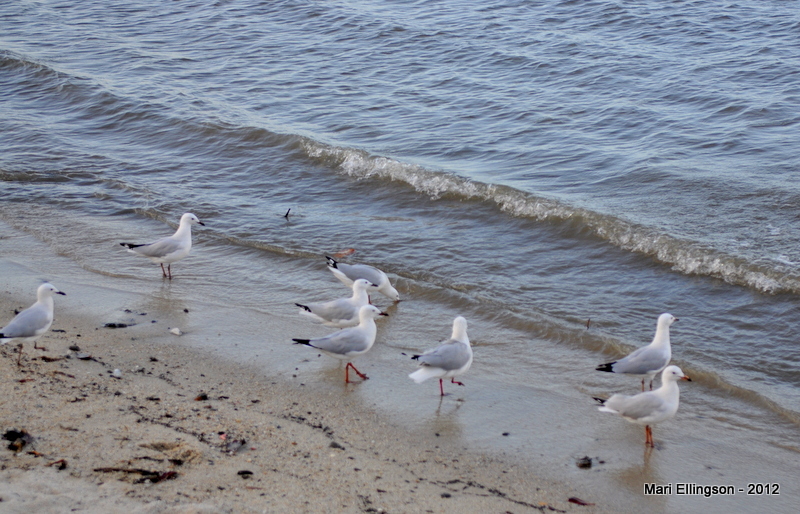 We looked around and at eachother and wondered whether we should attend or not. We could have laid on the excuse that we did not have the right kind of clothes for the event or we could have decided simply not to go. However, I reckon since we were the only ones from the Pacific Islands region and besides we were Papua New Guineans, such excuses are lame and embarrassing. So we bit the bullet and decided we were certainly on that bus to the festival. 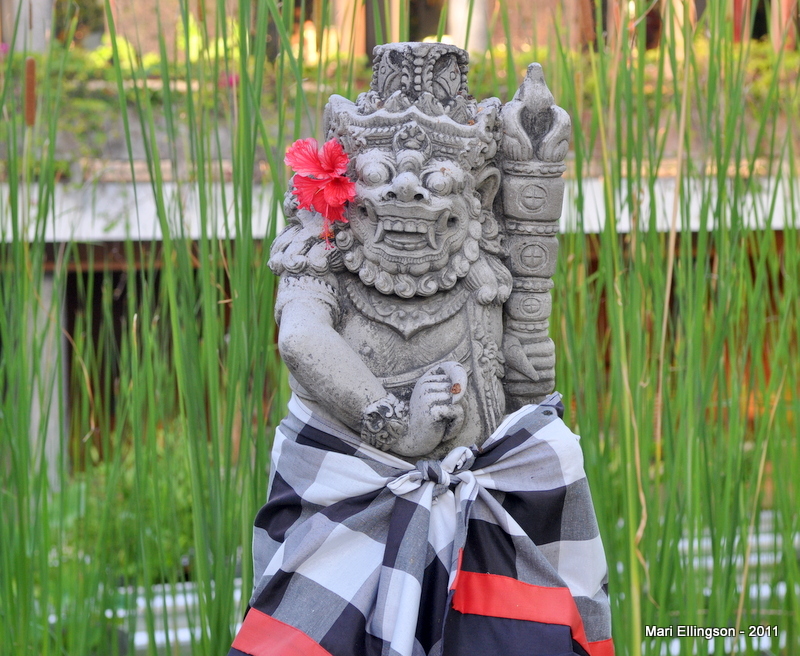 We might learn something valuable about Balinese culture – that made up our minds for us! 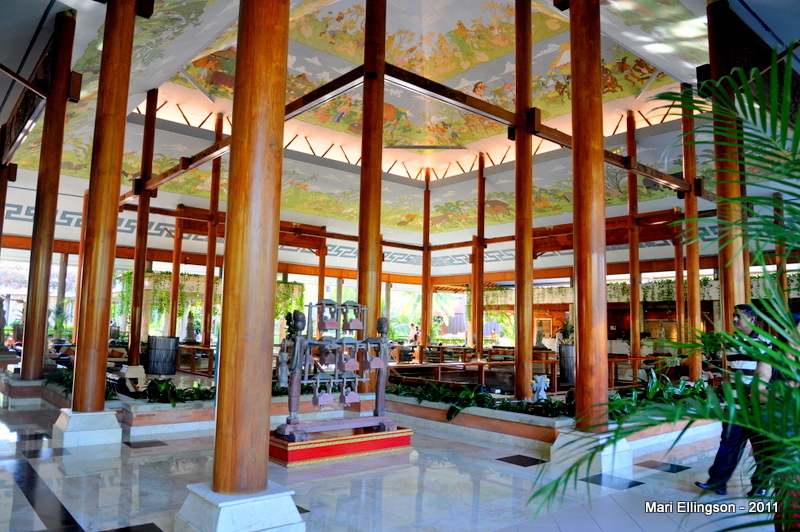 The grand foyer at the Melia Bali. Loved the high ceilings and open design. 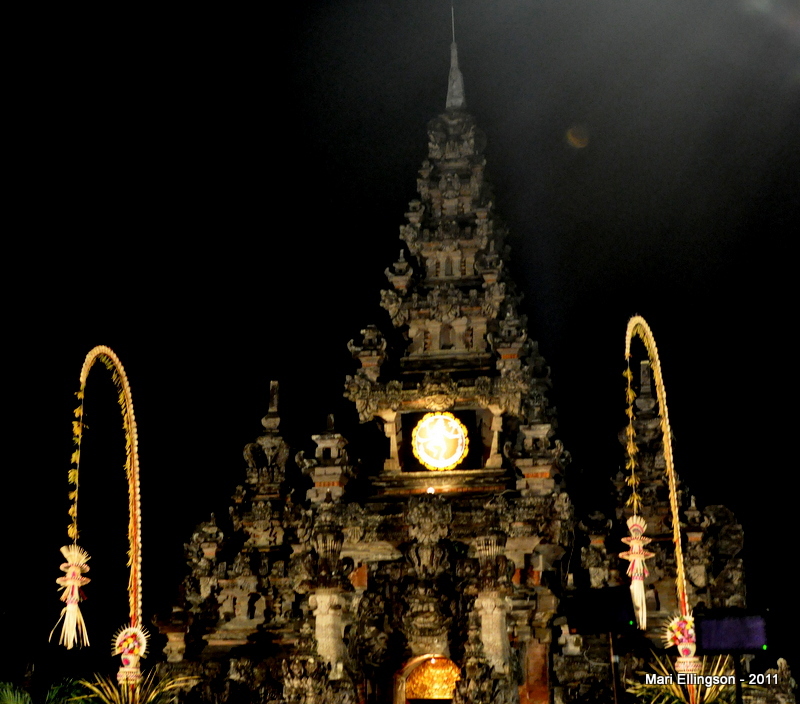 We had to think on our feet – there was no time to return to our hotel so the best thing we could do was purchase batik clothes. Batik is generally accepted as ‘formal’ wear so that was easy – but where to get batik-wear was the million dollar question. Thank goodness there was a souvenir shop at the Melia so we went in there pronto! After getting in and out of several outfits we settled on a blouse for me and a shirt for my colleague. At last we were set and felt confident that we can now join the other more formally attired fellow participants. A very valuable lesson for the future – advise all participants of the programme apart from the programme of the meeting proper for which we had traveled over 8 hours (including the overnight stop in Singapore) from our country via Singapore to participate in. One word to describe this place – grand! We joined the others were were already assembled at the hotel entrance and waited for our bus to arrive. 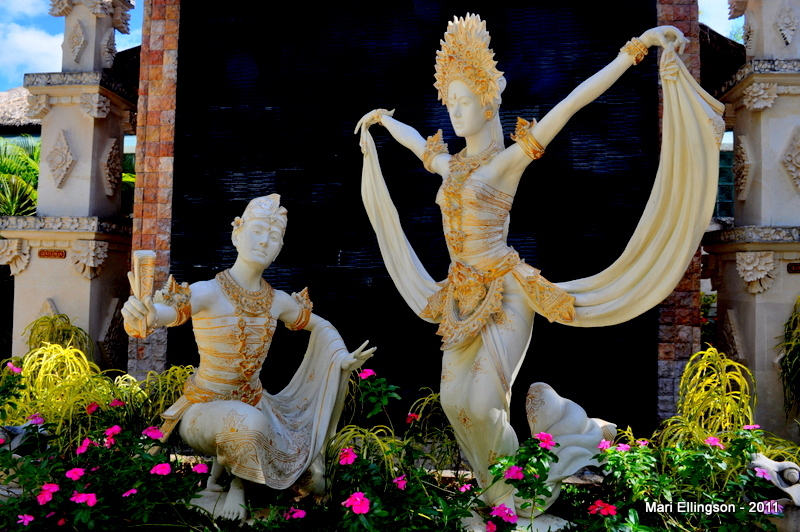 A stone sculpture on the grounds of the Melia Bali. By the way, we found out that we were not the only ones looking for something descent to wear to the festival and that made us feel better. 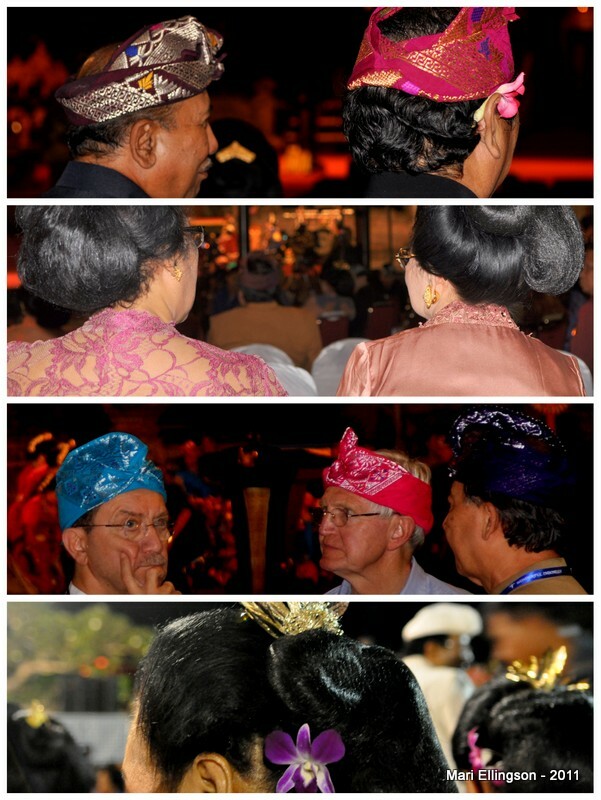 Another delegate to the meeting was also looking for something descent and more Balinese or Indonesian to wear. We didn’t feel too bad then. As we waited for the bus I spared a few minutes to take these shots. 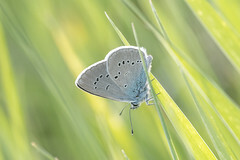 This beautiful sort of parasol caught my eye. Very ornate set. 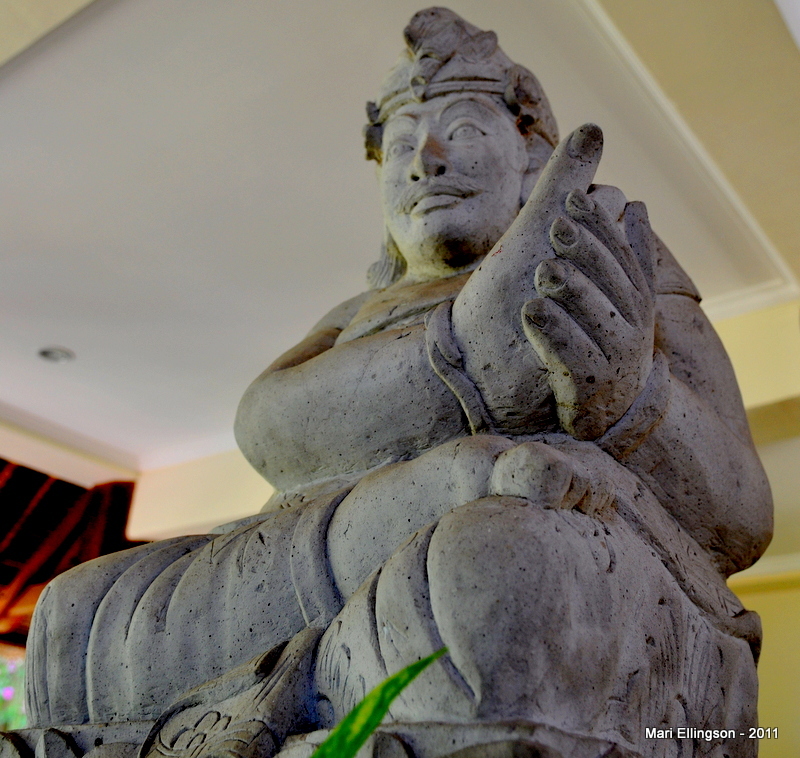 This hotel is bigger and grand than the Grand Bali Nusa Dua but I wasn’t disappointed at all – just glad that I could wonder around and take some shots of the Melia Hotel Bali. I’m always fascinated by hotels especially the architecture and the materials used. The Melia was no exception. I guess hotels anywhere always try to find the edge that induces tourists and those like us attending conferences and so on to feel like the hotel is a ‘home away from home’ and in some instances that is the case. I find that hotels in Asia actually fit into the category of ‘home away from home’ come to think of it. Another stone sculpture outside the hotel. Stone sculptures seemed to be a common feature at this hotel and my hotel. The black and white checkered fabric seems to be a feature at this hotel too. Our bus eventually arrived and as we clambered onto the bus, I wondered what the rooms at the Melia were like and what the rate per night was. En route to the festival we were served an early dinner in woven baskets on the bus. 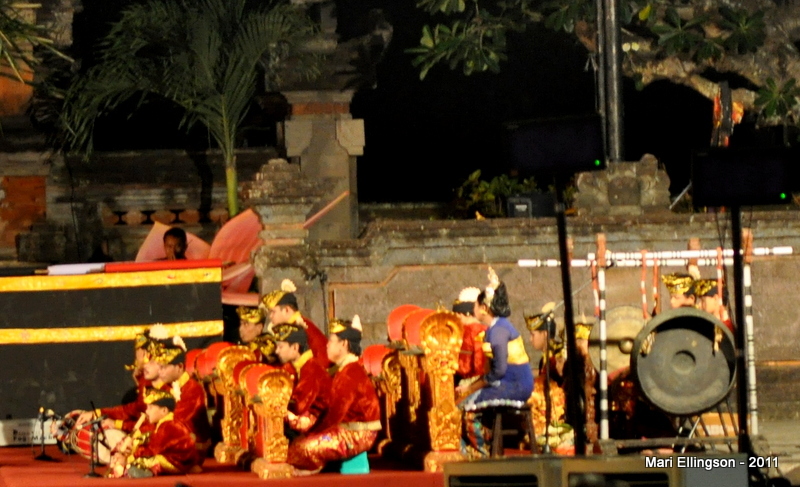 This was a novelty for me and I marvelled at the simplest things which the Balinese do as they extended the hand of friendship and hospitality wherever we went during our brief stay in Bali. I loved this sign – written with stones, on sand, and decorated with a flower. Lovely and elegant like everything about this hotel. The journey to the festival went smoothly and once again I felt so privileged to have been there and to have enjoyed the cultural programme besides even though we were not made aware of it when we arrived. I guess it was clearly a case of being at the right place at the right time. 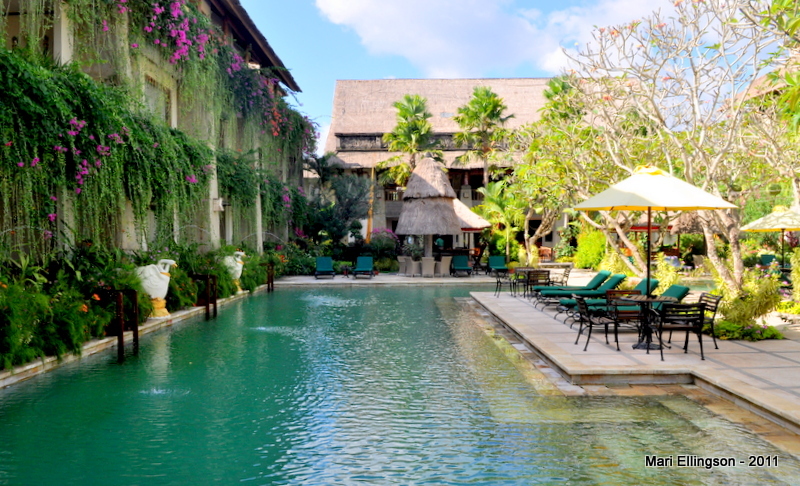 I’ve added the Melia Hotel Bali to my list of possible hotels to check out next time I plan to visit Bali. 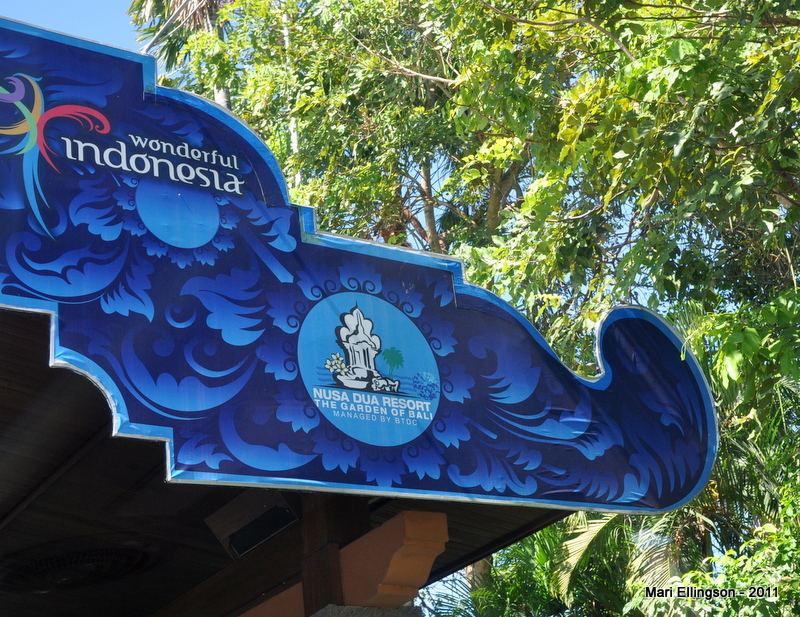 The welcome sign above the gate entrance as we manoeuvred towards the main road beyond – I was in Bali at last! 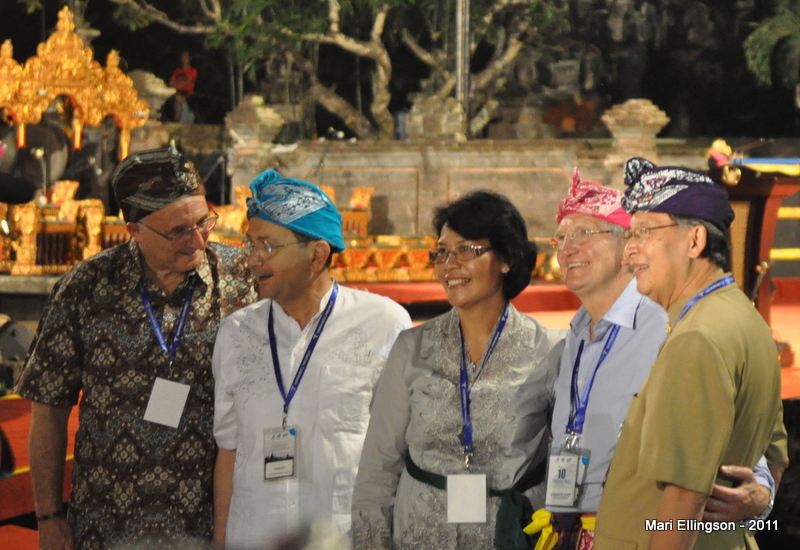 This is Part I of a couple of articles I wanted to write on my weekend meeting in Bali, Indonesia almost a year ago. I was one of the participants at the regional meeting on tourism ethics. 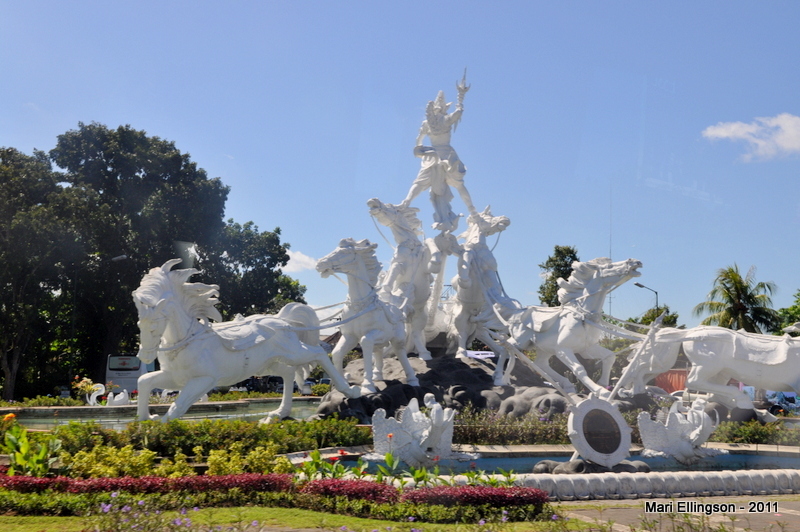 The tourism slogan greeted us at the entrance as we drove through and into the thick of the Friday afternoon traffic enroute to the Grand Bali Hotel – Nusa Dua. I attended the regional meeting on Global Ethics in Tourism June last year. 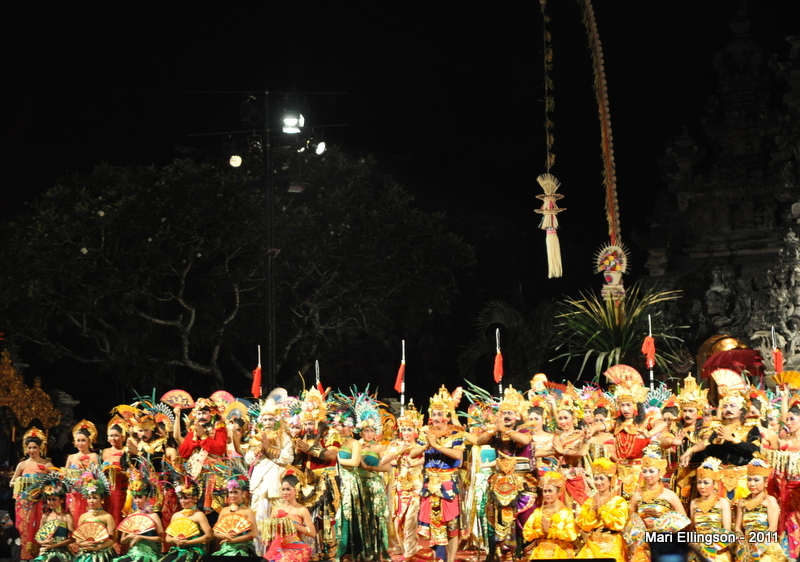 The meeting was jointly hosted by the United Nations World Tourism Organization and the Indonesian Government on the alluring and beautiful island of Bali. Papua New Guinea was the only Pacific Island represented at this regional meeting. One of the most amazing sculptures I’ve seen in a long time. This is Bali, Indonesia. Rich in history. 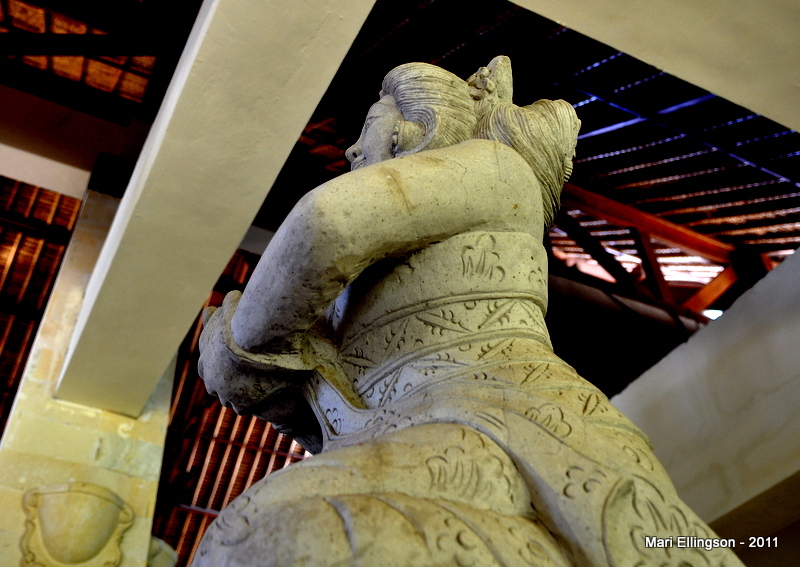 I wondered what this scupture depicts but did not have the time to ask – it was on our way to the hotel. 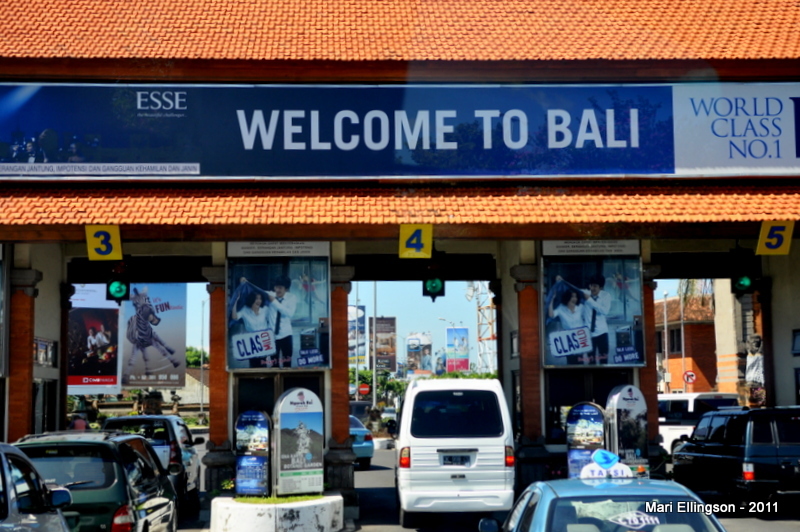 Upon arrival at the Ngurah Rai International Airport (sometimes known as the Denpasar International Airport) we were whisked through customs and immigration formalities and onto our bus. 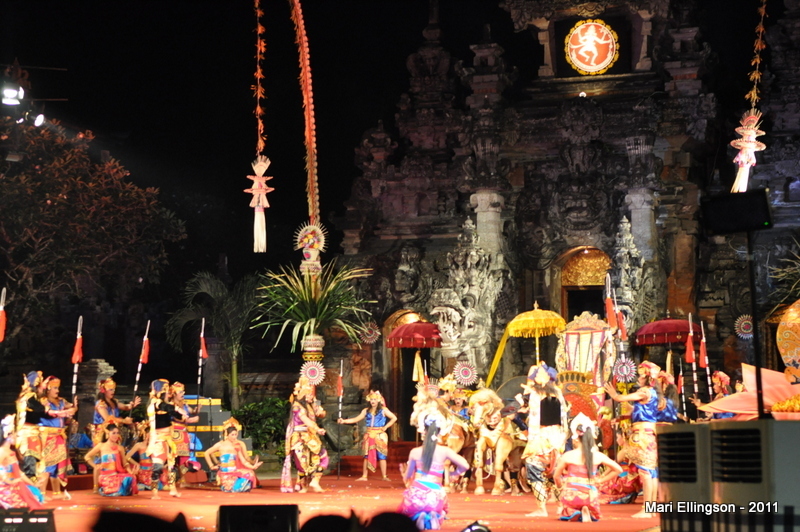 Denspasar is also the capital city of Bali. 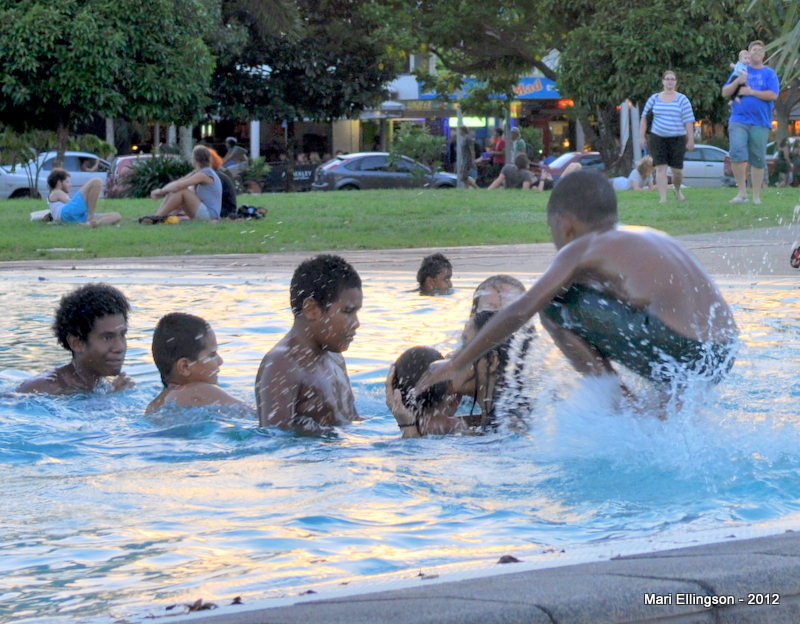 It was a very hot day but being from Port Moresby we rose to the challenge. In the bus, the aircon kicked in soon after so we were saved from having to change our clothes yet again in less than 6 hours! About 45 minutes later we arrived at the Hotel. It was another welcomed sight and again the formalities of checking in and getting our luggage delivered went swimmingly. 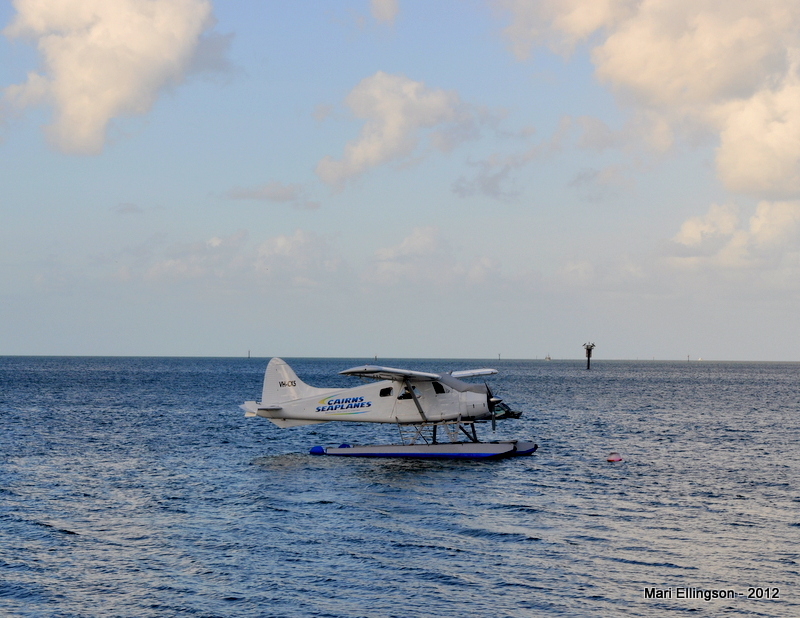 This was paradise – smoothness in getting through these formalities was expected and it was delivered. 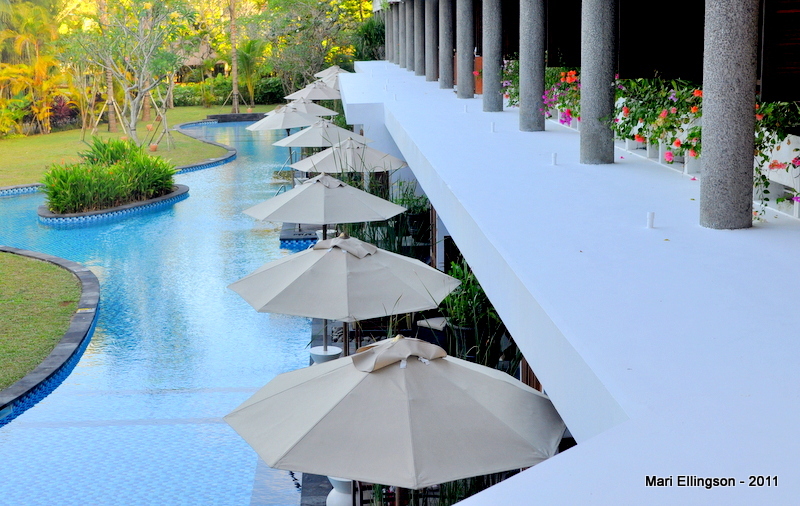 In Bali for that weekend’s meeting, the Grand Bali at Nusa Dua was our home. 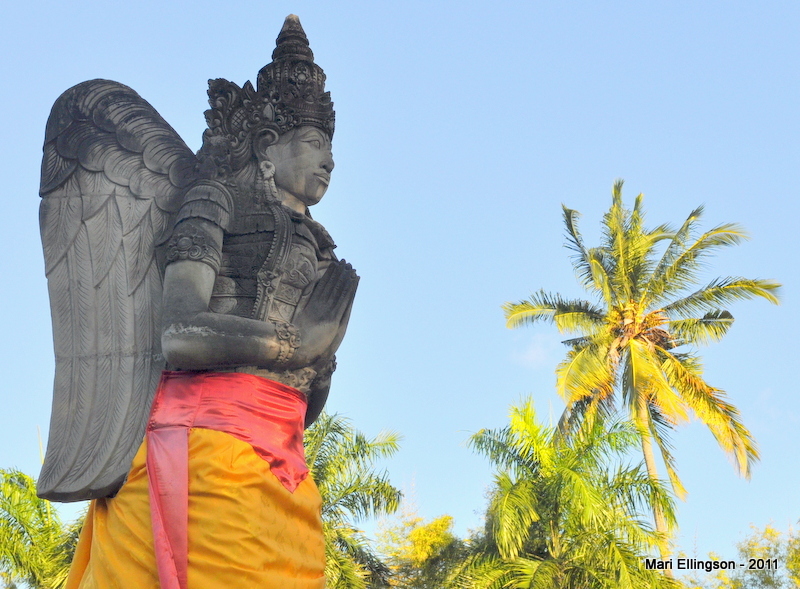 You can read about Nusa Dua here. I was once again struck by the seeming chaos on the streets where more than one person is riding pillion on a motor bike – hundreds of them darting in and out of the traffic and in between buses and cars as we wove our way towards Nusa Dua beach. I wondered how often there were accidents. My recollection was that very few but once in a while when an accident happens it is a very big thing and quite saddening as it is preventable! 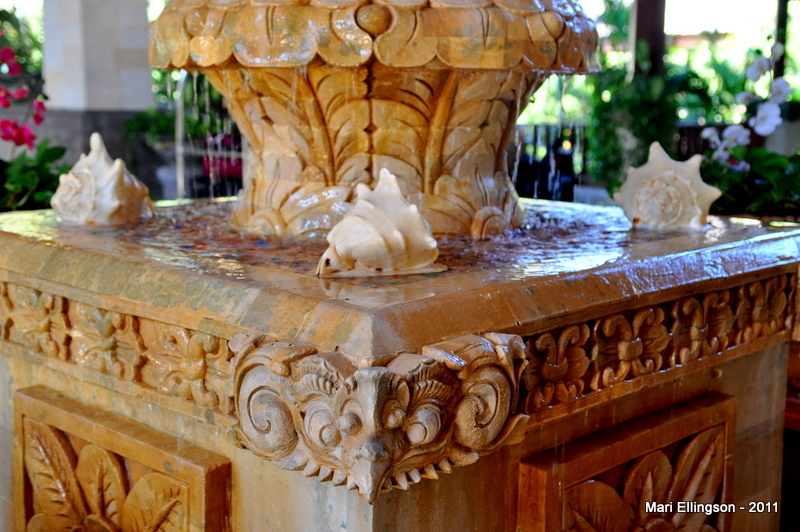 One of the stone sculptures in the hotel lobby. Impressive. 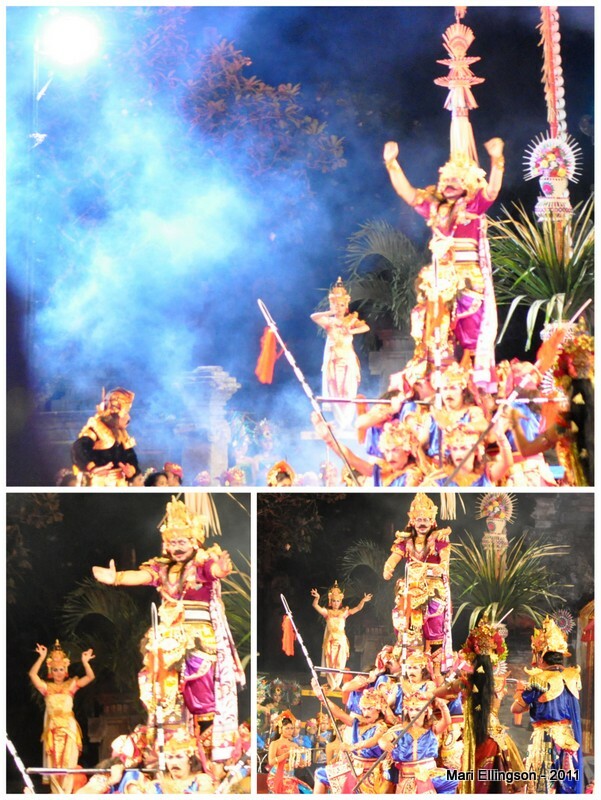 One is reminded that Balinese are Hindus. 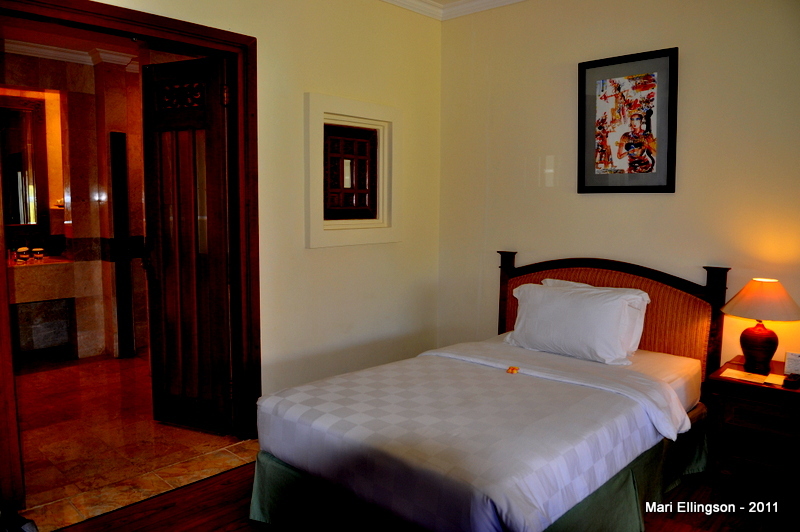 My colleague and I were accommodated in the Grand Bali Nusa Dua and grand may be a bit of a misnomer but the rooms were so spacious I could have my whole family sleeping in this one room. Spacious rooms, clean and comfortable with wooden floors – love wooden floors. This was my home for the weekend. The rooms were cool with no views to speak of but I was very comfortable. 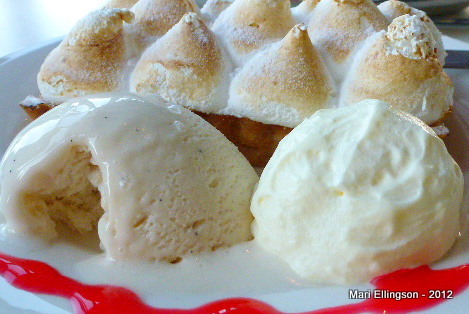 The aircon was working and that was what I needed at the beginning and end of each day. Another one of the stone sculptures. Impressive and awe-inspiring. 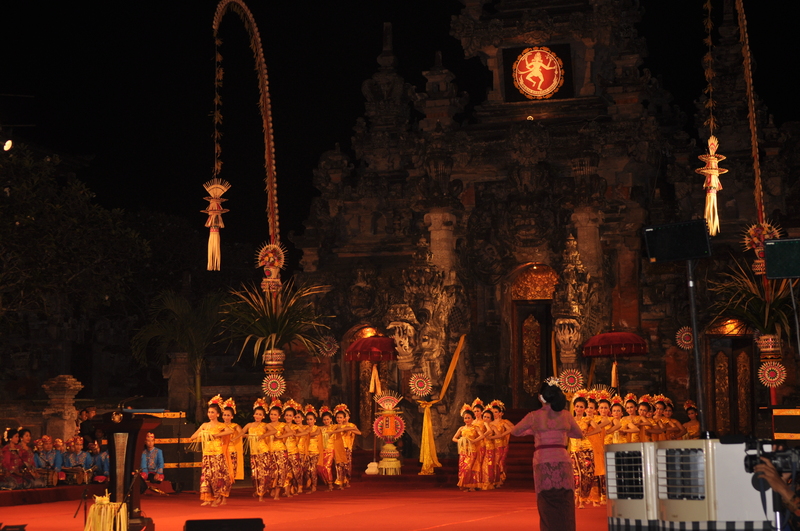 I was under no misapprehension that the Balinese are a very spiritual and religious people. I took quite a lot of photos upon arrival at the hotel and realised that I was in tourist mode. In fact one of the great things about this job is that you can be ‘on duty’ and be a tourist at the sametime. An enviable position to be in no doubt. I also went for a foot massage which is my favourite thing whenever I am in Southeast Asia. It is a soothing sort of thing to do and it kind of introduces me gently to the rigours of meetings or shopping whichever I happen to be in that country for. Entrance to the spa where I had my foot massage – reflexology is a great way to unwind and discover somethings about the way your internal organs are connected to pressure points in your feet! An amazing experience each time and this was not my first time to treat myself to such a luxurious start to my weekend in Bali. I went to the spa before the evening’s programme. I was glad I did because that was the only time I was able to enjoy being pampered. Oooh lala. Our meeting was scheduled for all of Saturday (which was the next day) and over the weekend so there were not many guests in our hotel. The meeting was held in another much bigger hotel and most of the other participants were accommodated there. 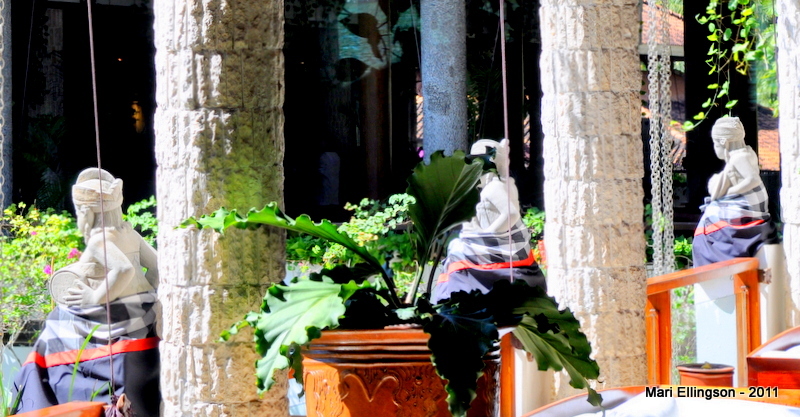 Beautiful stone sculptures in the hotel gardens. Did not have time to ask about this, wish I had. Am sure it tells a love story perhaps. 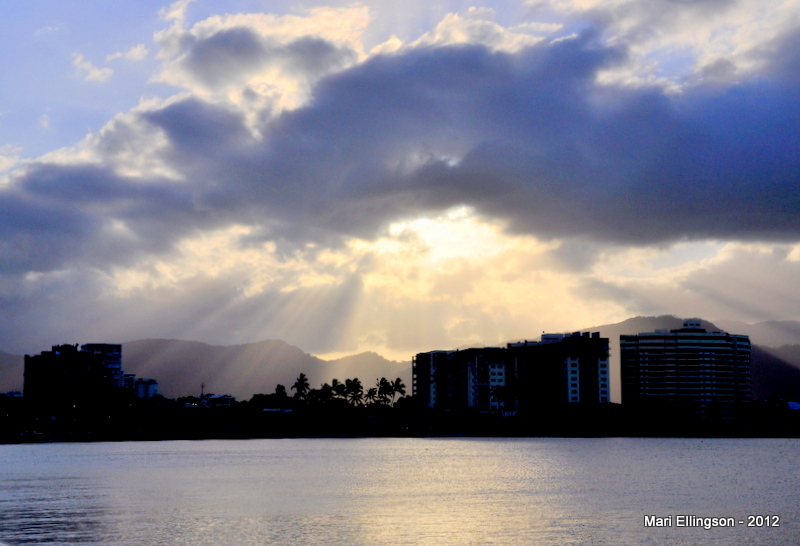 I was trigger-happy and my Nikon D90 was working overtime. Believe it or not, this is the swimming pool. The colour reminded me of one of the rivers in West New Britain, Papua New Guinea. The hotel grounds were so beautiful and tranquil. I was glad we stayed here. 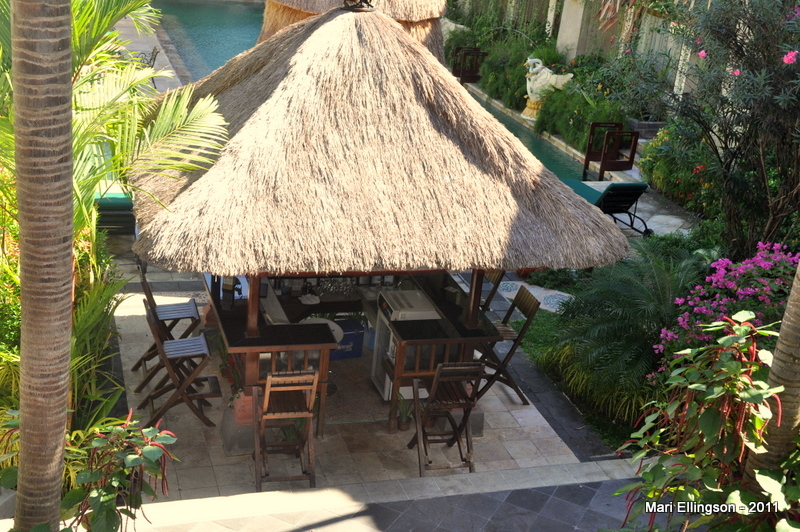 But then again there are so many hotels large and small spread across the Nusa Dua beachfront and no doubt other beaches in Kuta and Legian, as well as all over the island of Bali. This was a tourist mecca. The rooms were on the left on this floor. Lovely wooden balustrade. 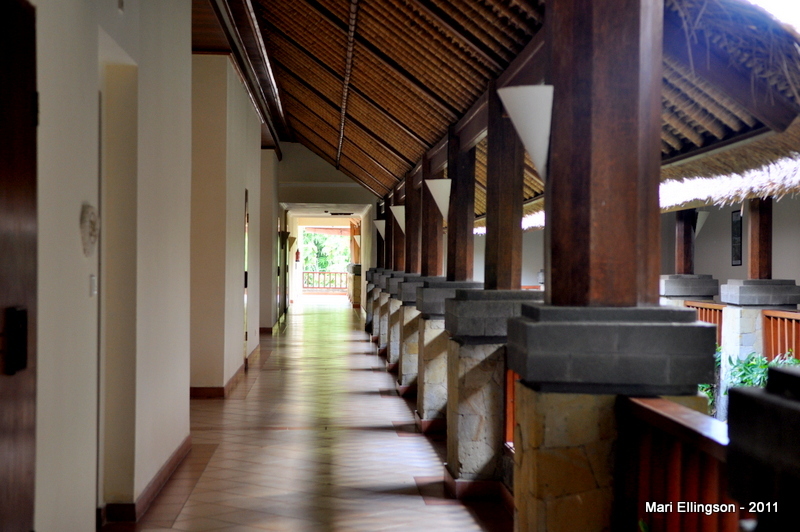 Wooden houses, floors and so on hold a special fascination for me but we were here to discuss the global code of ethics in tourism and I wondered whether the use of large amounts of wood in hotel construction was going to be sustainable in the long run. Food for thought. The view from my balcony. Couldn’t see the sea from here but then again with all the beautiful things to see inside and outside the hotel, I was not at all disappointed. I took quite a few photos around the hotel because I’ve never been in this hotel before and secondly, because I wanted to capture some of the spirit of the place. 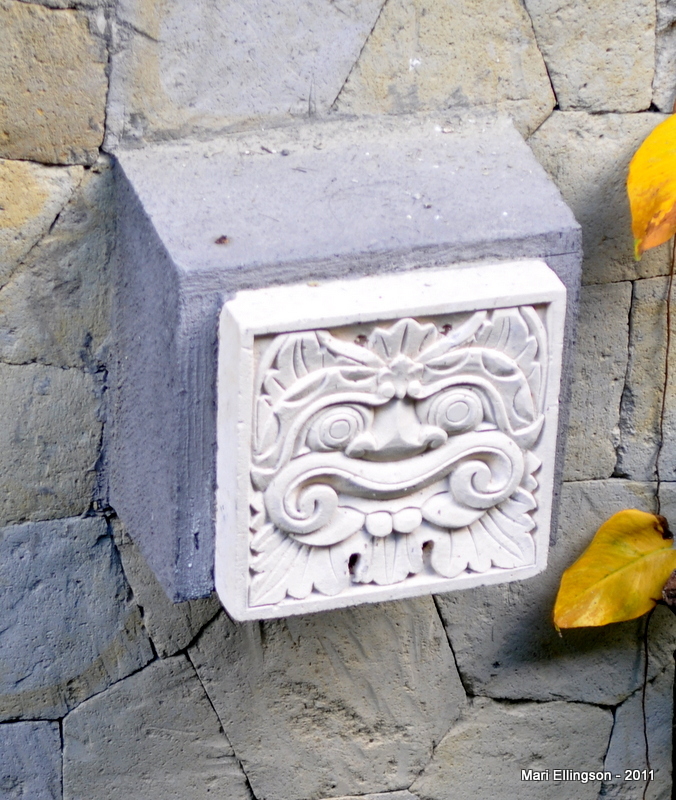 I came across this stone carving on the facade of the garden wall on my way back from the spa. Don’t know what it signifies but it seems like a common design on their wooden masks which are used in their elaborate dances. The stone sculptures are everywhere but again I did not have the time to ask. 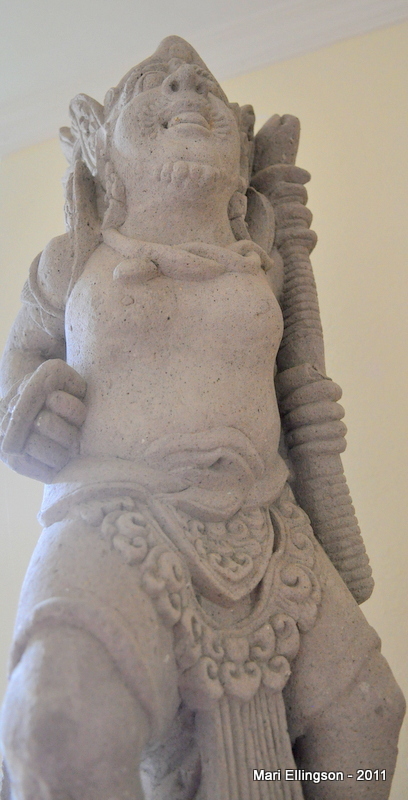 Another stone sculpture. Am not sure if these depict their Hindu gods. There was no time to ask and also there was a slight language barrier. I think the Conference organizers hired university or secondary school students to man the number of ‘help desks’ set up to fascilitate our hassle-free stay at the hotels where the participants were staying and most of these kids could not speak English or if they did it was spoken haltingly. Another stone sculpture – the detail is incredible. That wasn’t a problem on the whole but I could not ask many questions outside the usual stuff like asking for directions and when the bus will arrive and so on. I found these help desks very comforting – a lot of people engaged to ensure that we did not want of information. My attempts, haltingly at Bahasa Indonesia did help. At the hotel lobby. 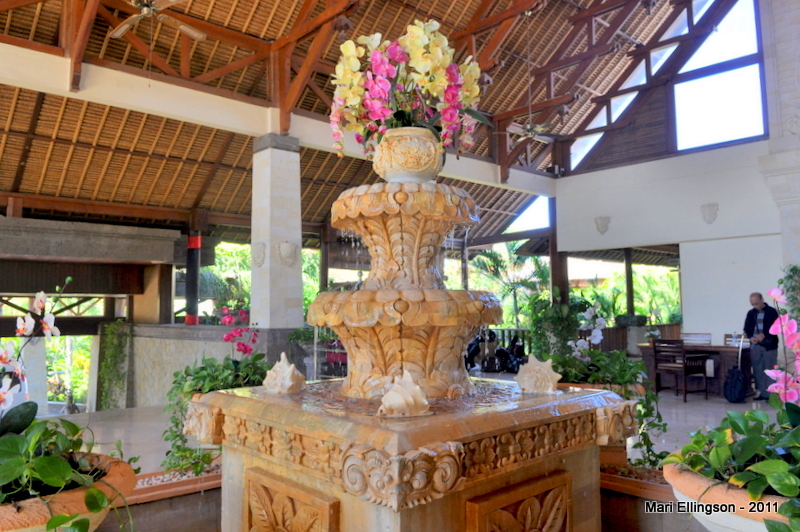 Beautiful and intricate carved stand for the vase of beautiful fresh flowers which graced the lobby area. One of the things I loved about the hotel was that it was open on all sides. Which meant there was a free flow of fresh air. 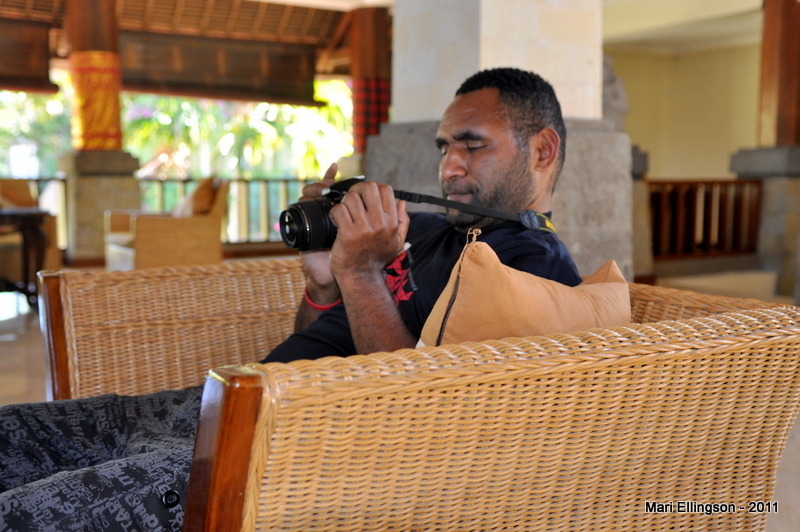 My colleague ‘man blo maunden’ in the lobby getting settled in and making sure the camera is primed and ready for action. We were also tourists there. The breeze flowing through large windows and doorways, reminded me so much of the South Pacific Forum Secretariat in Suva. 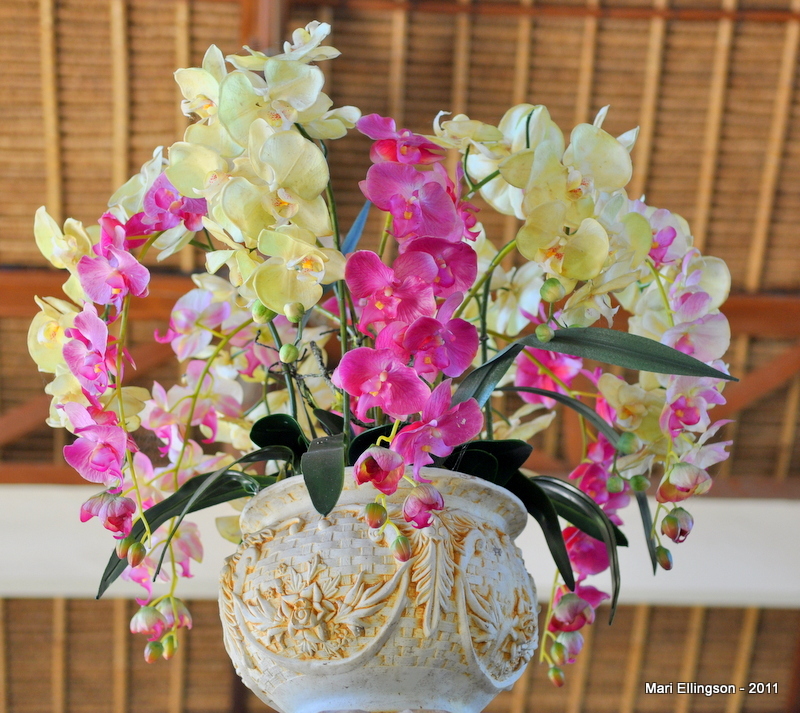 Fresh orchids in the lobby – a welcoming sight and feeling, for sure. 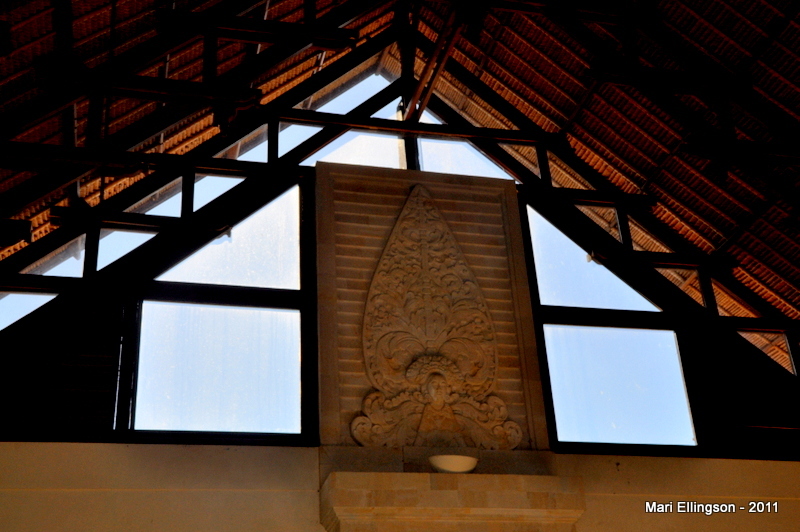 We left the Grand Nusa Dua on Monday morning when hotel staff were back at the posts and the hustle and bustle of preparations for a number of meetings in various wings of the hotel. The new week had begun and soon our meeting was a blur in the past and tranquility of the weekend. Looking down from the hotel lobby. Another view of the hotel from the south side of the pool. 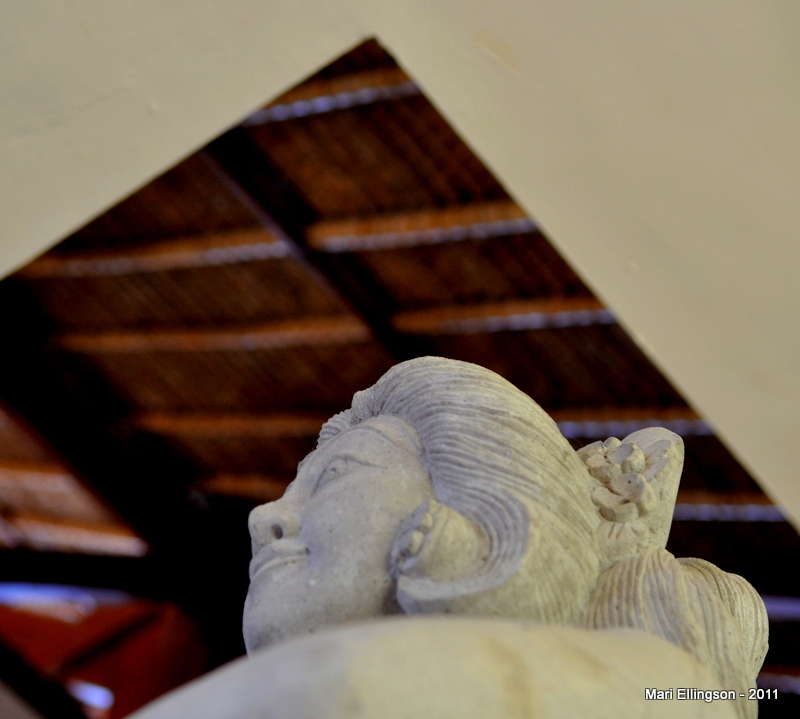 A stone carving ‘holding’ looked as though it was propping up the ceiling on the front, north facing. The carving of the bowl left me wondering as to what the bowl was for. Didn’t get the chance to find out. Perhaps one day when I return as a fully-fledged tourist, I might remember to ask. 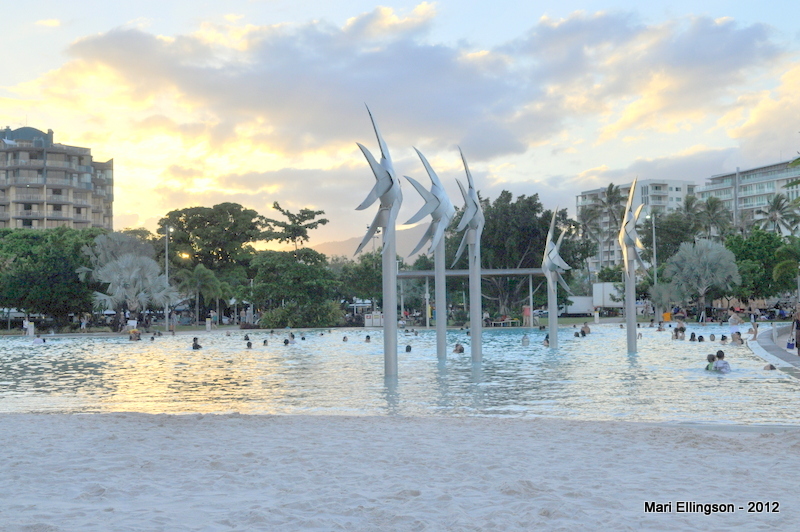 The weekend meeting in Bali was a wonderful way of ending the week – part of it was spent in Port Moresby. 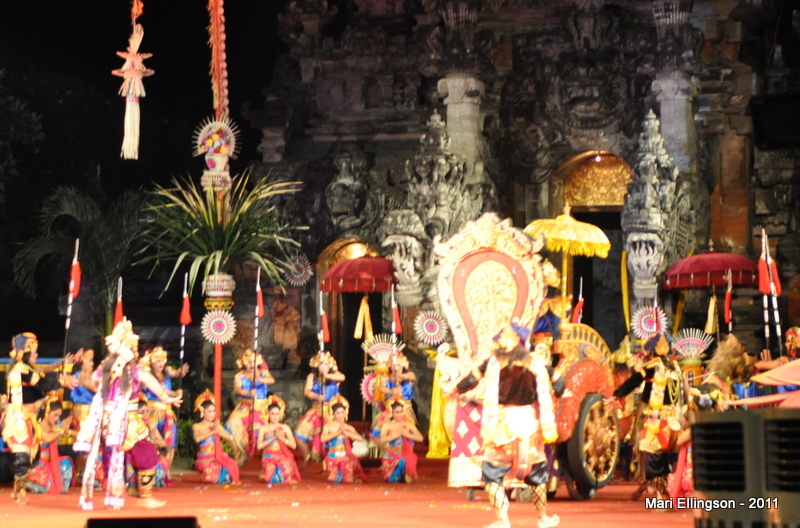 During our short stay in Bali and as part of the social and cultural programme of the meeting we were treated to a number of cultural performances. 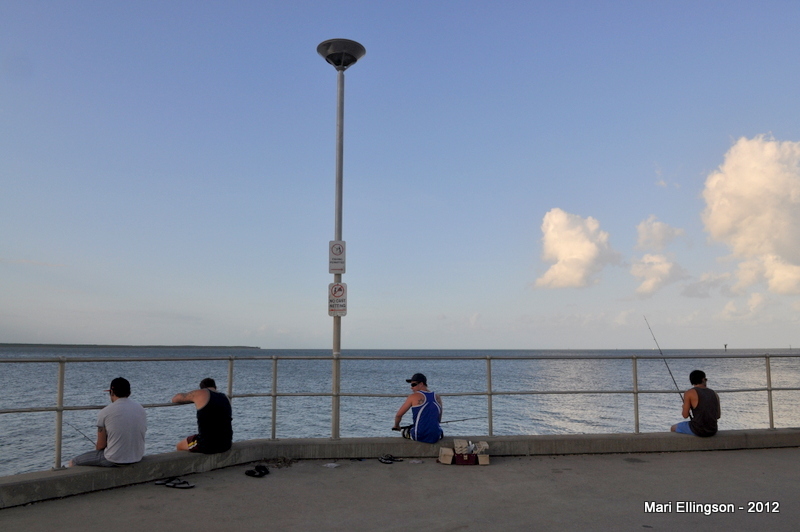 It was one of those memorable times I’ve spent in any one place where it was short enough to take in as much as I could take in of the place thanks to my faithful Nikon D90 and the other was long enough to enjoy what the place had to offer. Author islandmeriPosted on 28/05/2012 29/05/2012 Categories Art and Artists, Christianity & Religion, Flowers and Gardens, History, Historical Figures & Events, Miscellaneous, Nature, Photography, Cameras & Equipment, Travel & RecreationTags Bali, Bali religion, Balinese, Denpasar International Airport, Depasar, Global Ethics on Tourism, Grand Bali, Grand Bali at Nusa Dua, Hindu Bali, Indonesia, Ngurah Rai International Airport, Nusa Dua Bali, Nusa Dua beach, stone carvings, stone sculptures, UN World Tourism Organization2 Comments on Bali: Loved It! 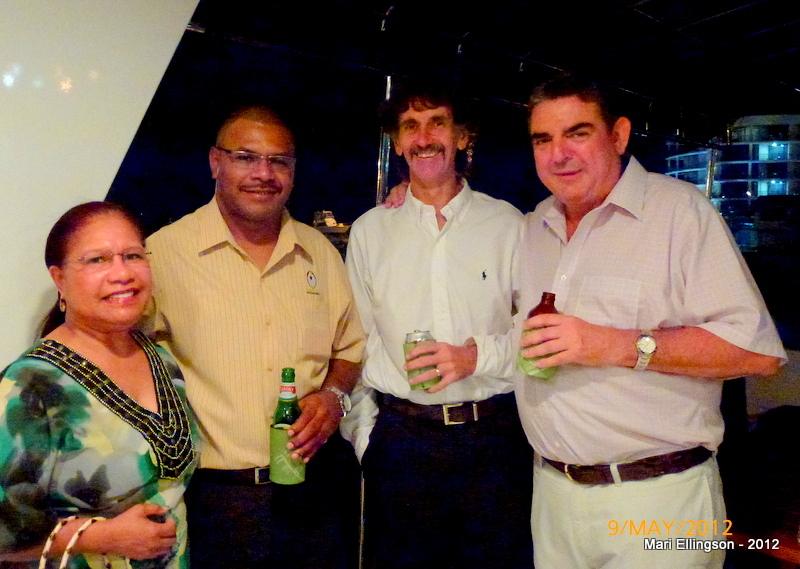 Yours truly with some of the invited VIPs on board the MV South Pacific, owned and operated by the Bank of South Pacific. 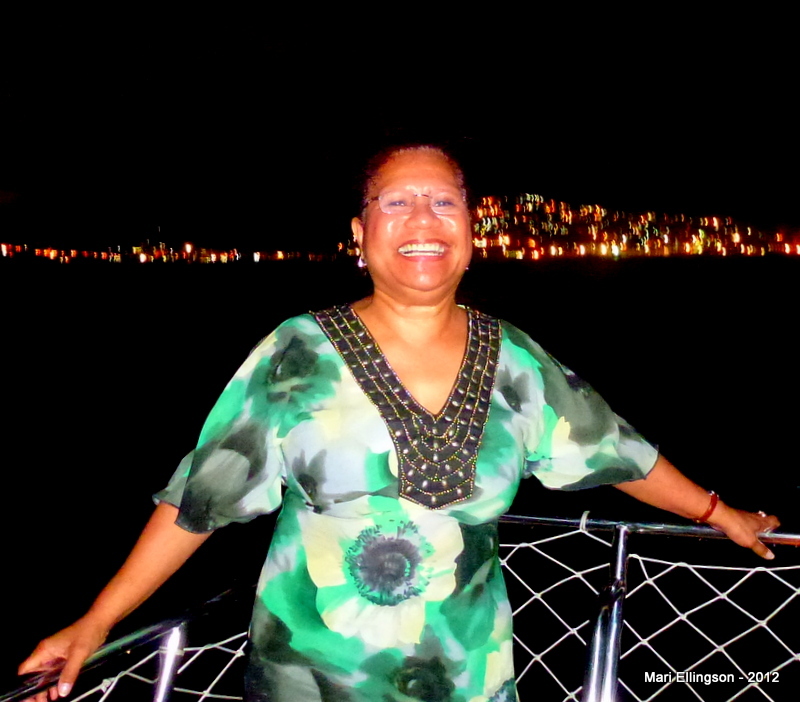 Recently, I was one of the invitees to join the top brass of the Bank of South Pacific on their boat the MV South Pacific for a dinner cruise around Fairfax Harbour, Port Moresby, Papua New Guinea. 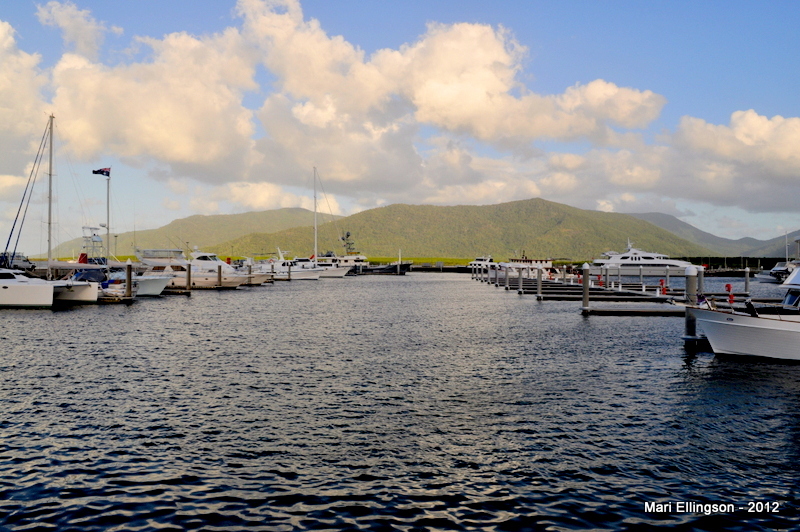 Fairfax Harbour is probably one of the best natural harbours in the country and in the Pacific Region. I shudder at the thought of more of the seaviews disappearing so fast so we miss out on the harbour views when driving into downtown Port Moresby nowadays. We used to be able to see the sea but slowly construction of many new buildings and the extensions of the port along the waterfront is obstructing this view that we used to take for granted. 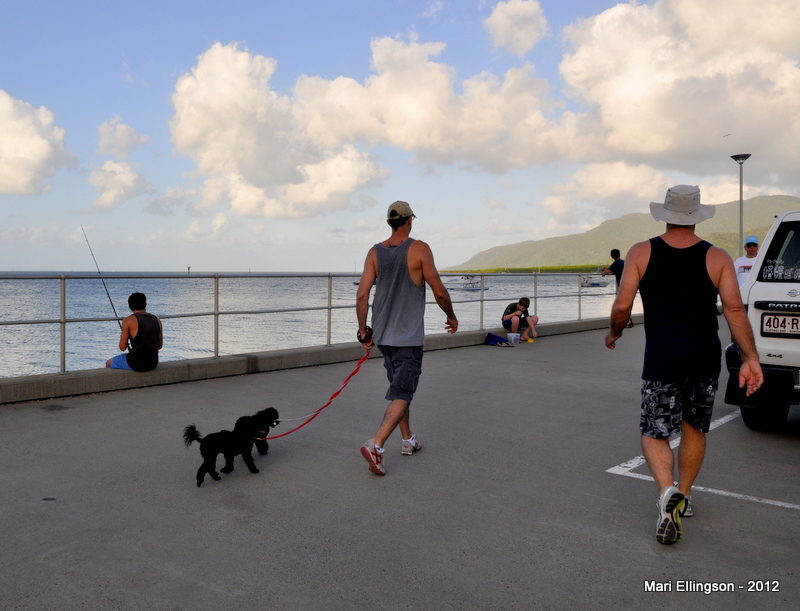 It will be gone forever and it is beyond the control of so many ordinary people in Port Moresby who would want to get a glimpse of the harbour on their way downtown or back up towards the hinterland. Soon we’d have to go up Port Road or Paga Hill to be able to take in unobstructed views of our beloved Fairfax Harbour. Getting out of the marina and into the harbour. The evening started off with heavy rain. It was a little daunting also trying to find Finger B which was where our boat was moored. It took me 15 minutes to finally find it with the help of a couple of helful RPYC security guards. Of course me not been a member of the RPYC made it difficult too. Anyway, I finally found the place and was greeted by two friendly and helpful ladies. 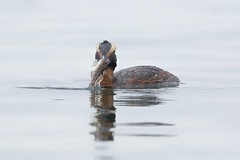 I braved the drizzle walking down the length of the pier to get onboard but what a lovely reward at the end of the walk. Of course climbing up the stairs in rain was a bit of a challenge with the ever-present hazard of falling into the sea should I get a foot wrong going up. But I mustered all the strength and skill recalled from my early years growing up on Kwato Island and the many times we had to get on and off the mission boats come rain and shine got me up the ladder and on to dry deck. Cheers! we’re off on an evening cruise around Fairfax Harbour. I met others who were already there and was soon holding on to a cool glass of orange juice. 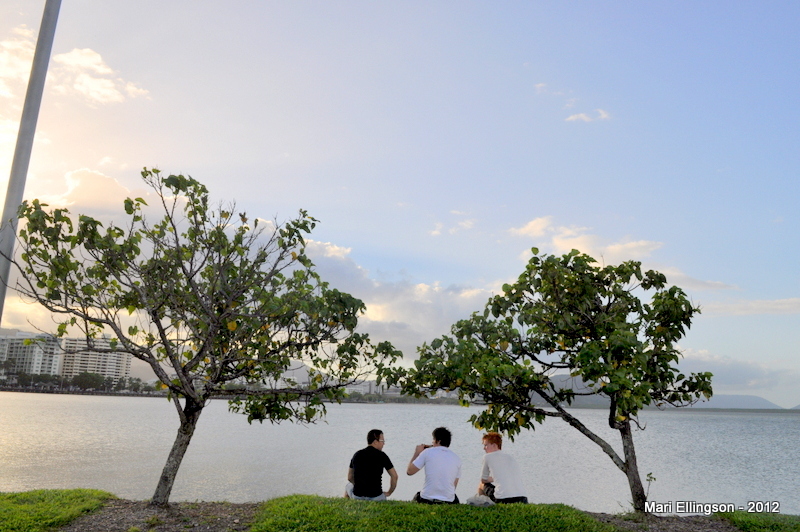 As we sipped our drinks and slowly got to meet the others the rain subsided and it was calm and dry. 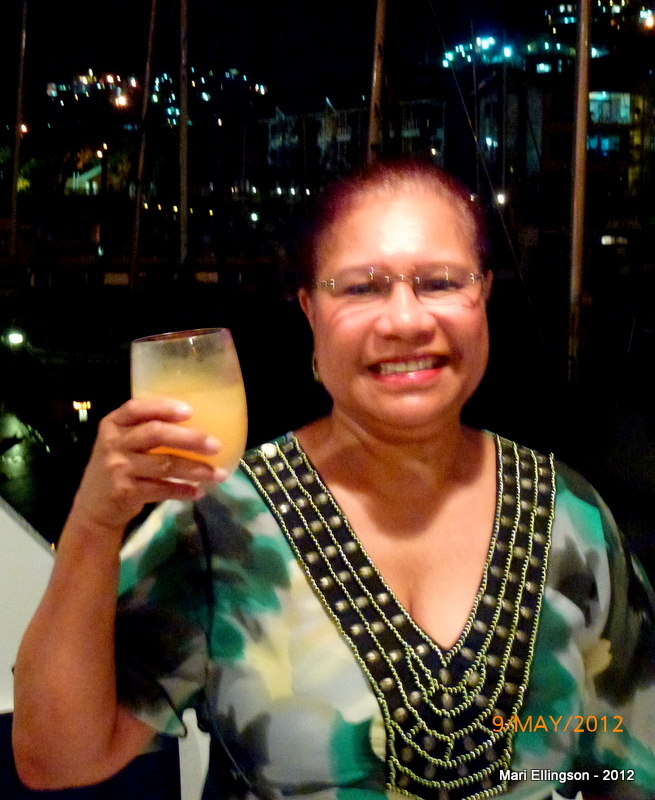 This was something different – to be on a boat in the harbour sipping a cold drink and meeting new people on a rainy evening. Of all of them, I had met only three (3) people prior to the cruise. I was delighted to join our BSP friends and this small gathering on board. Not long after the rain cleared, it was decided we should cast off. So we were going on our evening cruise after all. The rain had not dampened our spirits and expectations to cruise around the harbour this evening. After a brief explanation on the boat itself and a fine one too, the Captain gave us a safety briefing and then we were off as we slowly edged our way out of the marina. A great sense of freedom, adventure and well-being came over me. 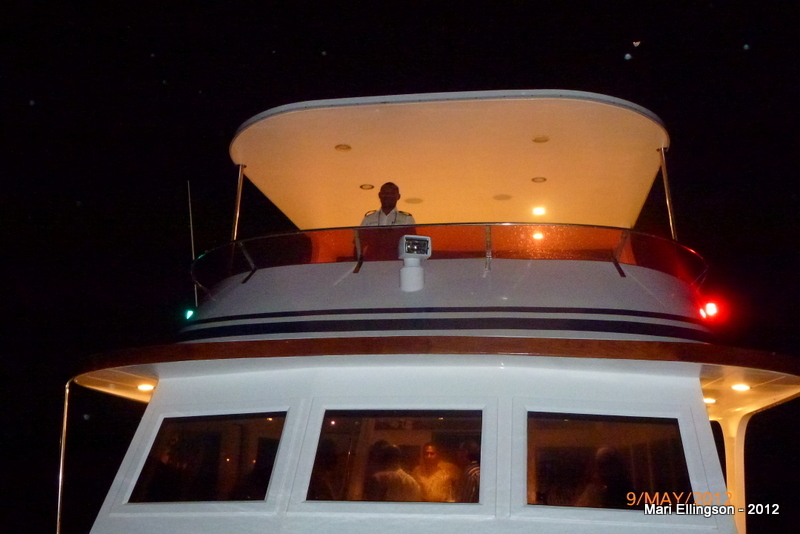 A lone figure at the helm – our able Captain Simeon at the helm of the MV South Pacific, owned and operated by the Bank of South Pacific (BSP). The sea was calm but a little breeze to remind us we were on a boat and gliding gracefully over the water. Just outside the RPYC there is a massive contruction site and this is the view from the harbour. Looks different, obviously. I couldn’t believe the fact that I was seeing Port Moresby by night from the harbour, and rarer still the opportunity to do so this evening. It was just a very nice feeling to be out and about without having to look over my shoulder. I must say the city looked beautiful this evening. 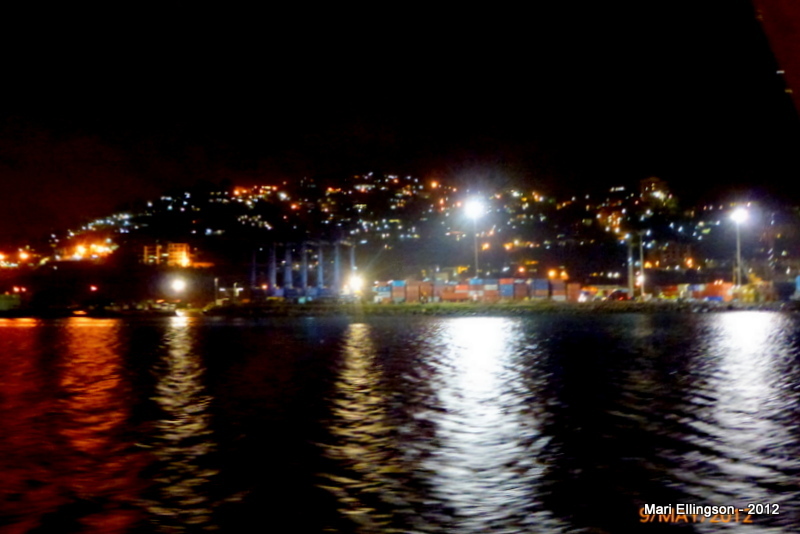 Port Moresby’s waterfront. 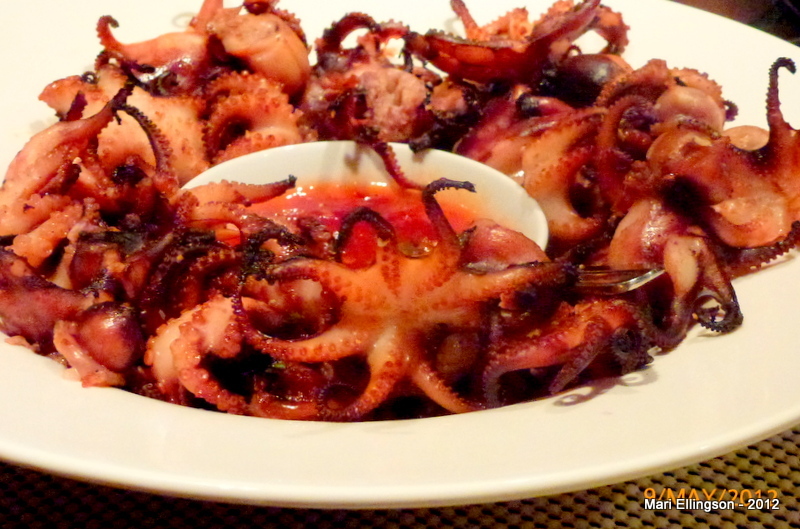 It would be really nice to have a seafood restaurant along the seafront. Now that would be something. 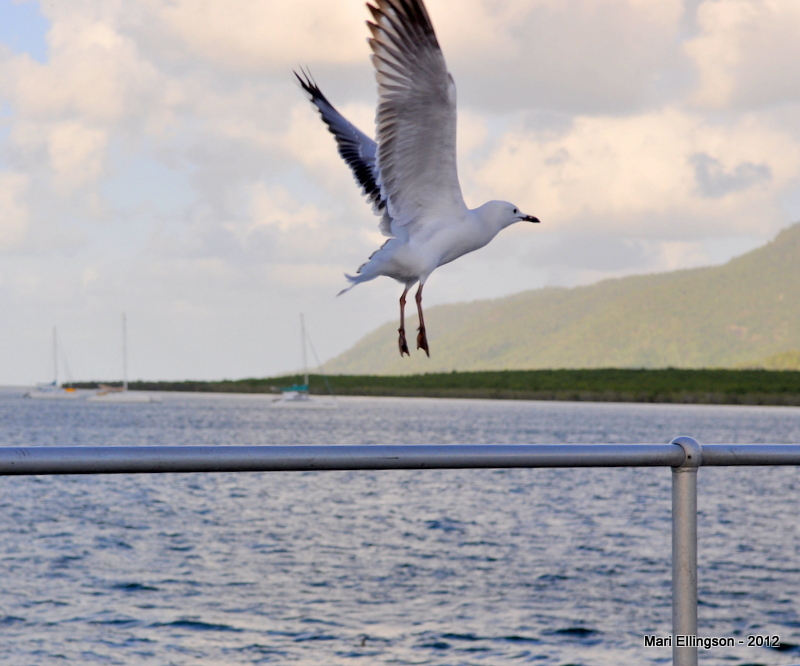 As the boat moved out into the harbour I was transported back to my childhood days albeit momentarily. When on school holidays from Cameron High School we would board one of the mission boats – either the Osiri or Labini – one or the other for Samarai, Logea and Kwato. 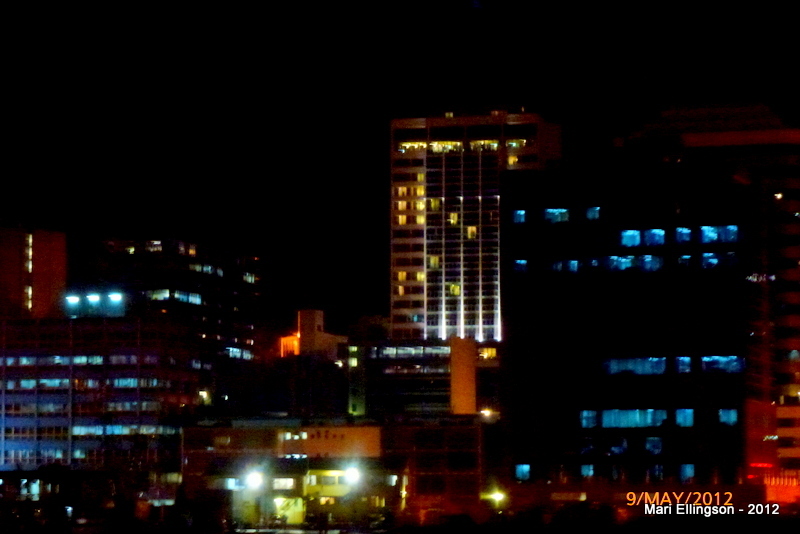 Part of Port Moresby’s skyline. 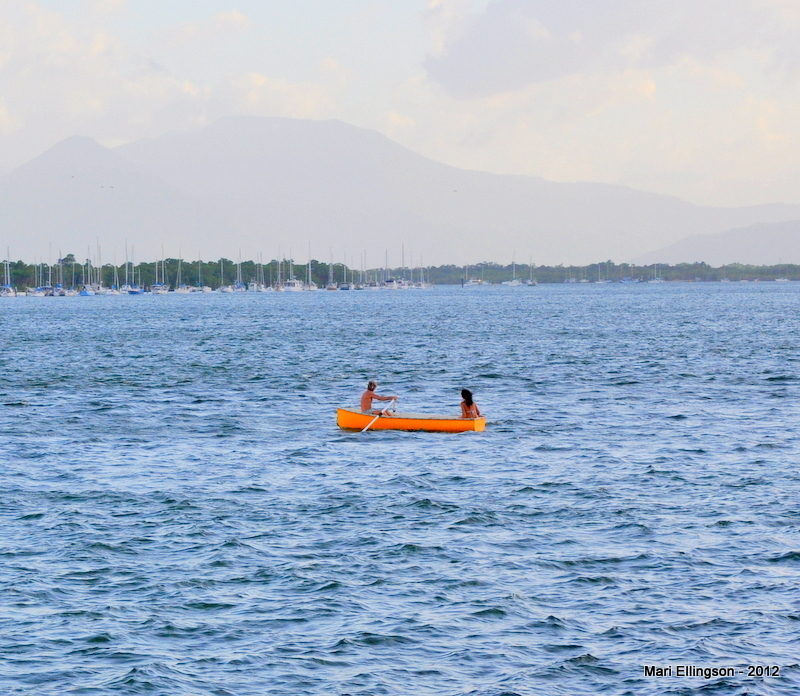 Could see the towering Grand Papua. I used to feel rather cheeky arriving at night because no-one knew which school children have come home to the island for the school holidays until the following morning or at Church. The container wharf with the large cranes. Massive. Don’t know whether they can expand anymore with all the shipping activity going on everyday. The reflection of lights on the water held a certain facination for me. And now I couldn’t help feeling a sense of deja vu. I decided to stand back and enjoy the views in the cool evening. 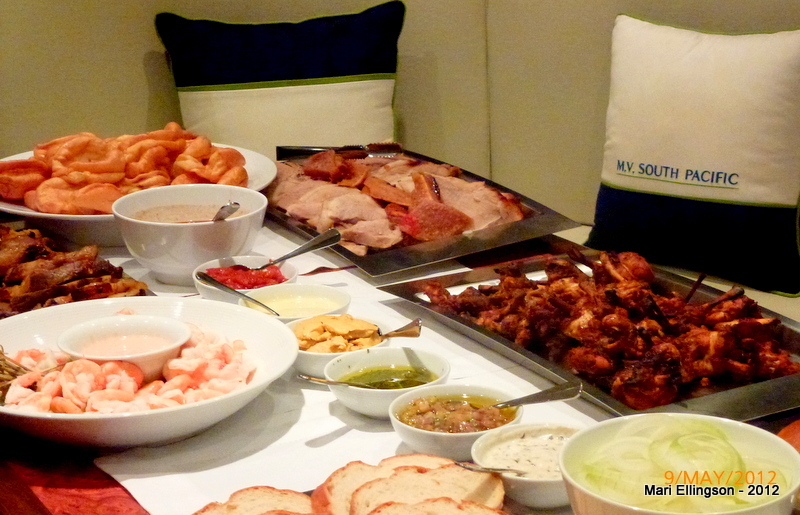 One of the delectable dishes served for dinner on board. Yumsko! 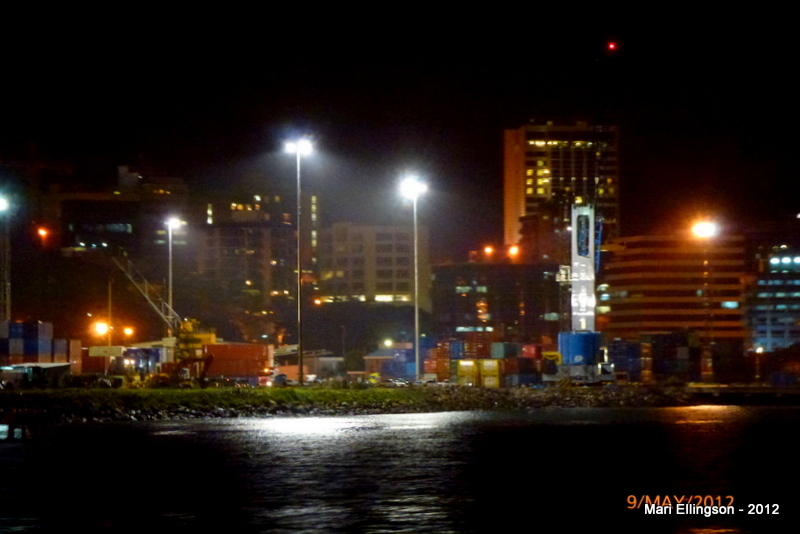 Looking back the way we came out of the Royal Papua Yacht Club marina and out in the open I focused my sights and my camera on the lights of Port Moresby. Well, what do you know the city looked stunning with all the lights and the colourful patterns on the water from the many different coloured lights. Dinner was served and soon we went downstairs to partake of the tasty morsels laid before us. 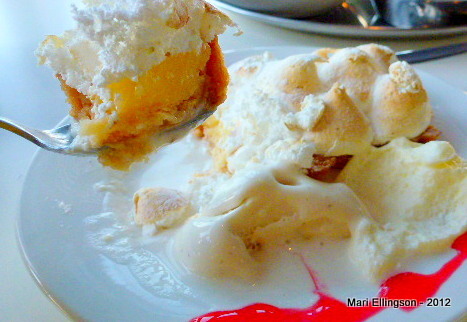 One of the things I take for granted is that I am not seasick and the food was a welcome sight. 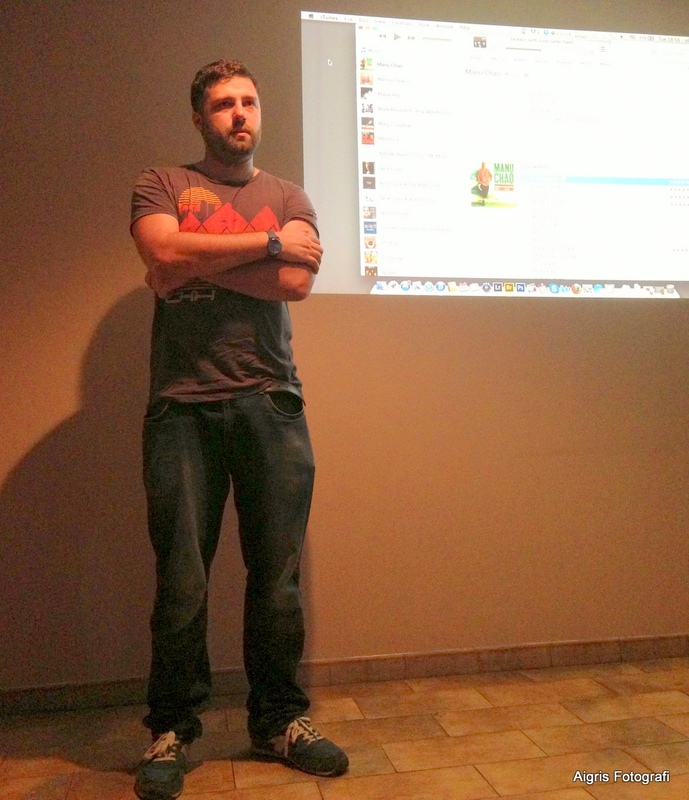 After a few words of welcome and updates on BSP from the CEO we tucked in. 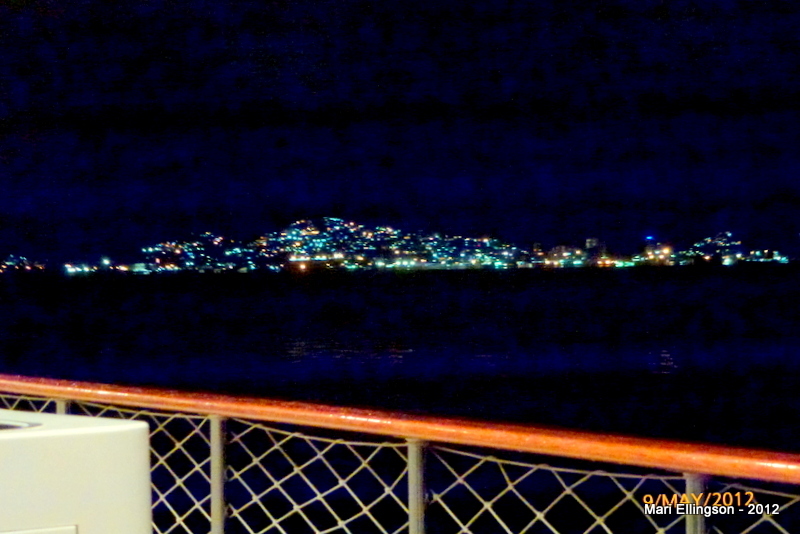 Later on I went aft to enjoy the sights of Port Moresby from the boat. 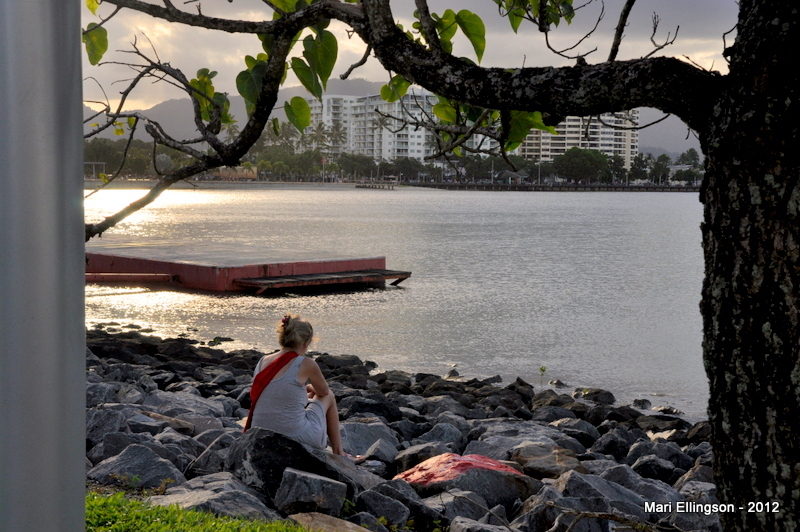 Port Moresby looked like a reclining lady in red, yellow and orange sequinns shimmering against a dark sky. 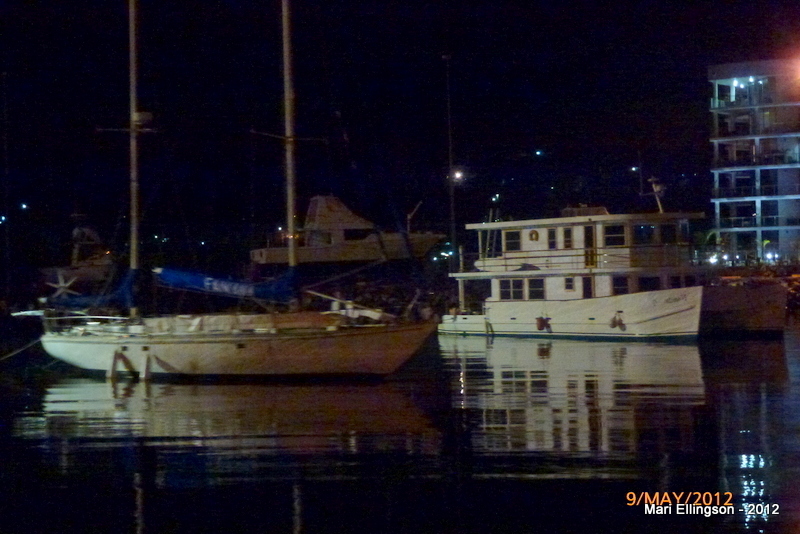 I went past a couple of big ships and then to Napa Napa and Motukea then infront of Tatana on our return to the marina. The last time I was on a boat in the harbour was in the ’80s and was a passenger or spectator on one somebody’s boat watching the regatta or some sailing competition. It’s all so hazy now. 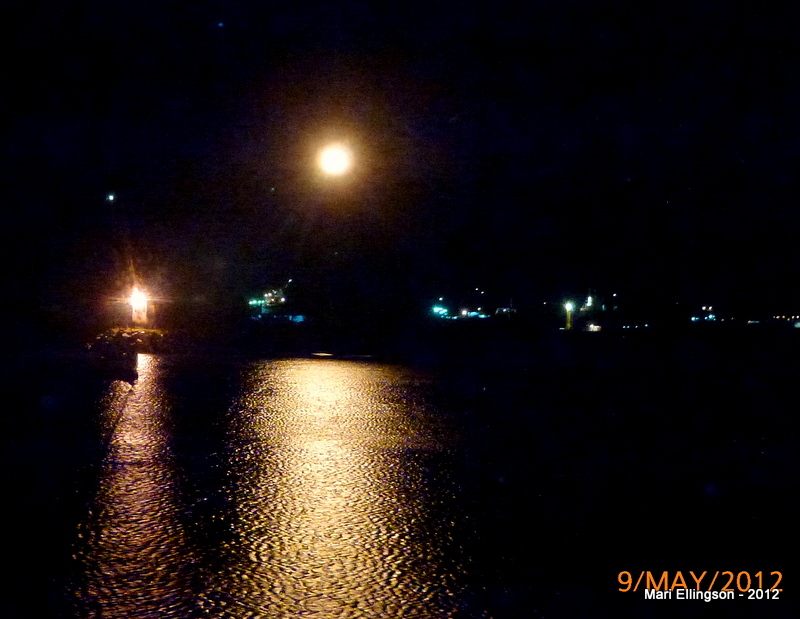 But anyway, this was the first time I am out in the Harbour at night. 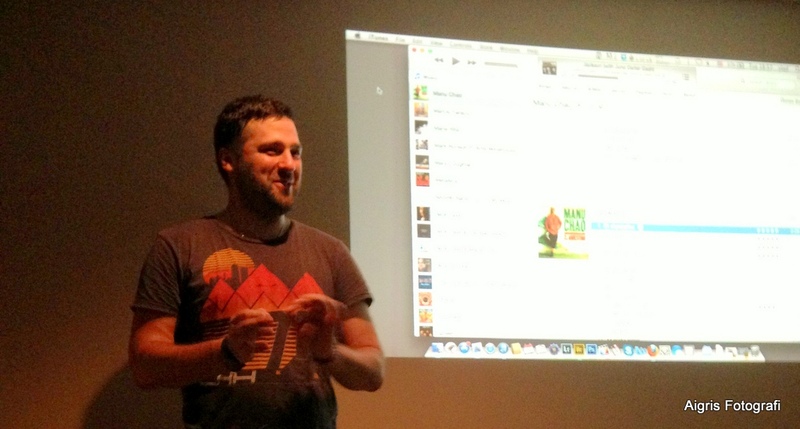 No, I wasn’t trying to sing ‘My Heart Will Go On’ – in fact am facing the wrong way. City lights in the background. I look out on the harbour from my office day in day out and to be in it myself in the same place that so many container vessels use during the day was an awesome thought. The city looked like something out of Star Wars or Galactica. My camera was clicking all the time we were cruising around but the constant movement did not help but I think I managed to get some. I did the best I could but happy that I can actually take photos. One of the views from the bow of the boat. Fascinating. 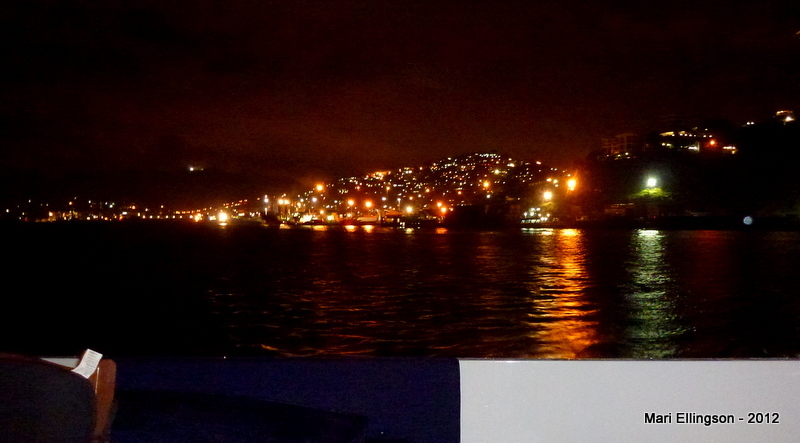 Thank you so much Mr Clyne and your managers for giving us the privilege to go on a harbour cruise and to enjoy Port Moresby at night this way. 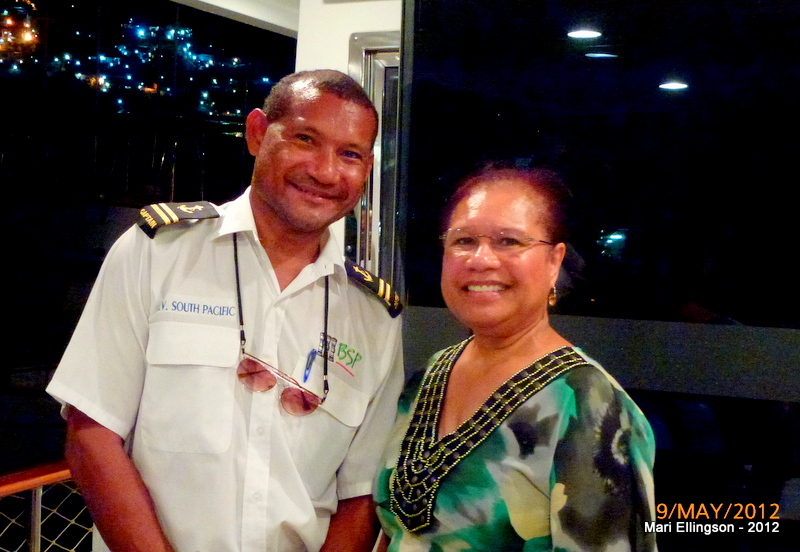 Thank you Captain Simeon for taking us out on the MV South Pacific and bringing us safely back home. All too soon our cruise came to an end at about 9.00pm. 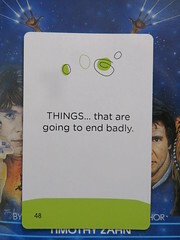 We were back at the marina and then it was goodbyes and I took my leave. 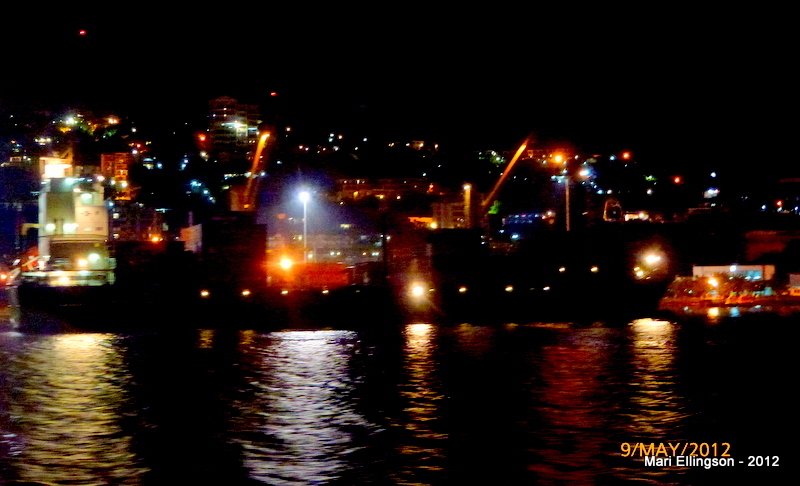 Driving home, I thought about the cruise, about the MV South Pacific, about BSP and the food we enjoyed and most of all about seeing the lights of Port Moresby this way. Captain Simeon and I at the end of the cruise. 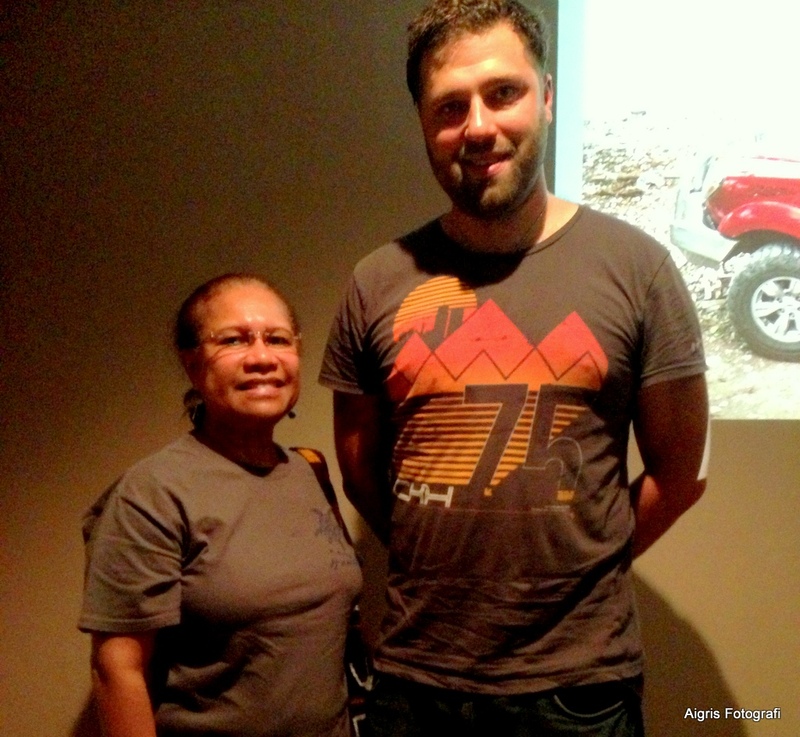 He’s my wantok from the Trobs – kagutoki Captain Simeon for a great cruise. There ain’t no nicer way to enjoy the night air in Port Moresby than a wonderful cruise in Fairfax Harbour on an evening like this. 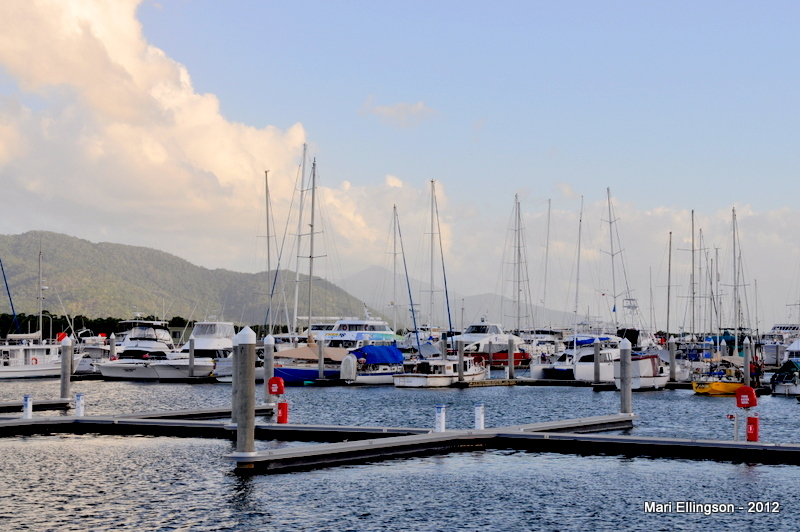 Approaching the marina – coming up to berth. The City in the background. Crossed the bridge from South Bank. 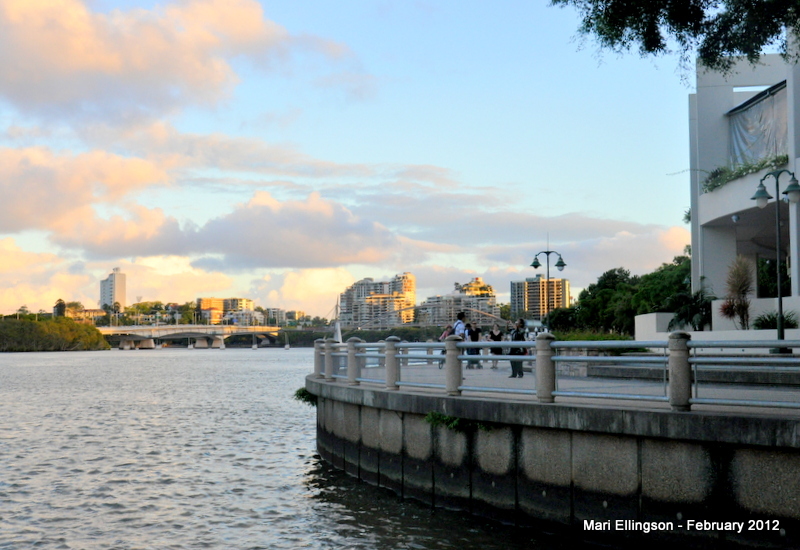 It was a relaxing walk and one I really enjoyed taking in the sights over the River. 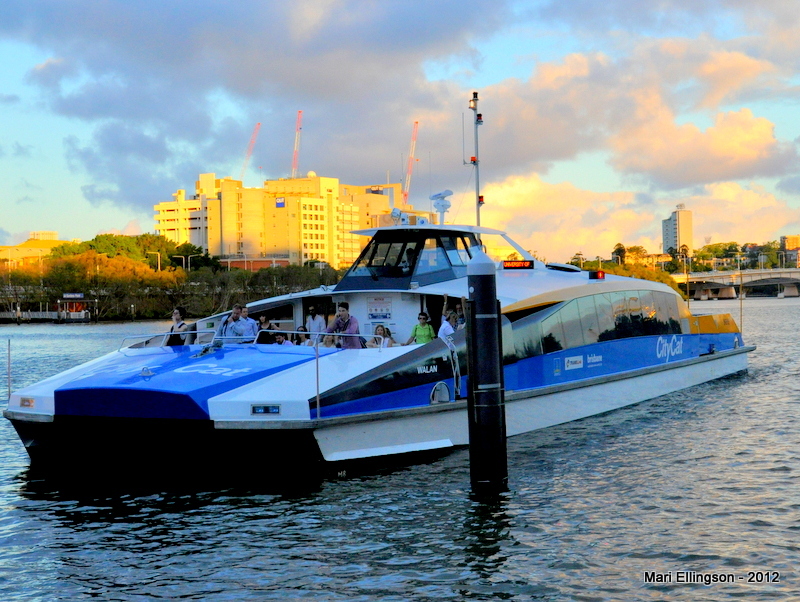 When in Brisbane, one of Australia’s beautiful cities, it is a must to try the City Cat, many of these boats or catamarans ply the River and are a very convenient and inexpensive way to travel (no traffic!) or drop by one of its glitzy shopping streets in the heart of the city. The City Cat - a very convenient, fast and inexpensive way to travel up and down River. Each of the Cats has an indigenous Australia name which is interesting and they have the explanations of names on board. 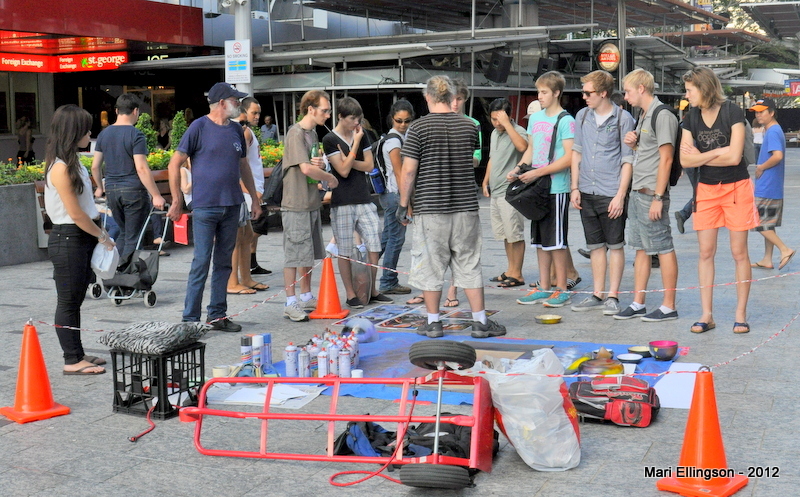 Walking along Brisbane’s Queen Street Mall, or the shopping hub of the city and for people like me – temporary visitors with a yearning to acquire something new for the wardrobe, kitchen or just taking in the sights and sounds of the City centre – can be a very pleasant after-work wokabaut. 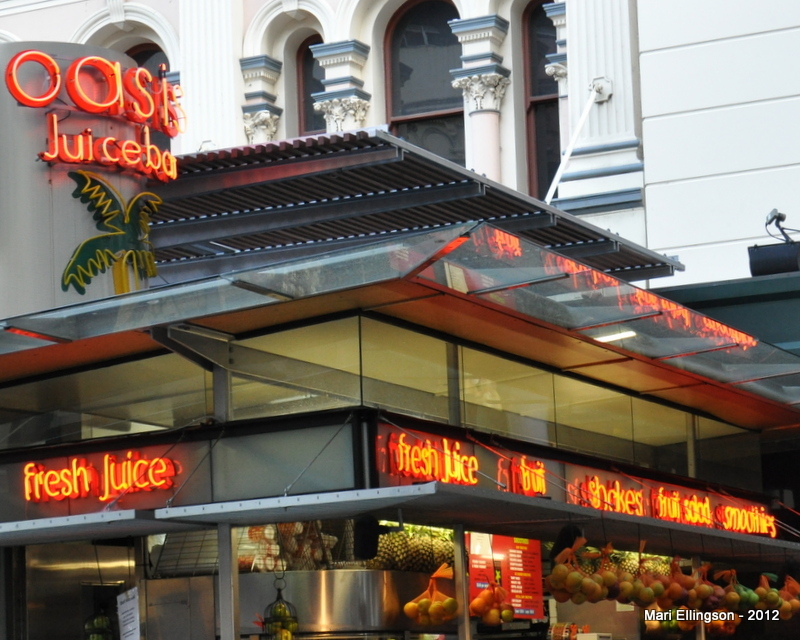 One of the many eateries along the Queen Street Mall. 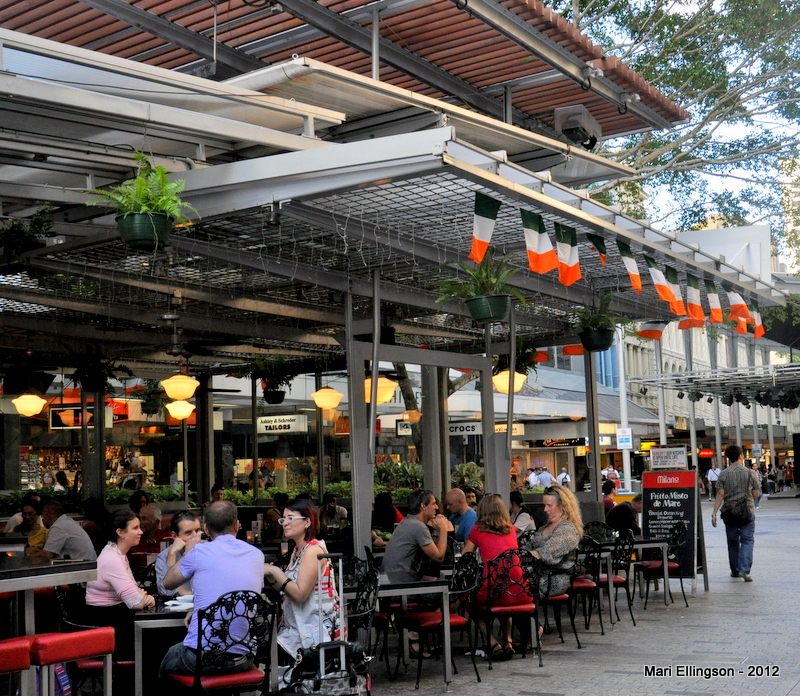 Friday afternoon after work is a good time to hang around the Mall area albeit for a short time, unless one wants to stay on for the evening and the many other attractions, especially restaurants in the vicinity which come alive in the night. The fresh fruit juice stand. An an oasis alright. I visited the fresh fruit juice stall. This is a real oasis for the thirsty. Walking around, window shopping or just taking in the sights on a Friday afternoon can leave you very thirsty especially on a hot and muggy afternoon. 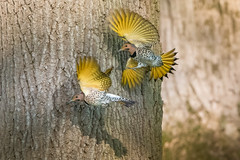 Rock 'n Roll dancing - takes me back to the 60s - the music and all. The flaired skirts, shoes and stockings. I watched some rock ‘n roll dancing (took me back to the 60s). The dancing was to promote a new shop that opened along the Mall. There was a long line of people enquiring about jobs etc that I decided I’d watch the dancing instead. Much more interesting I reckon. 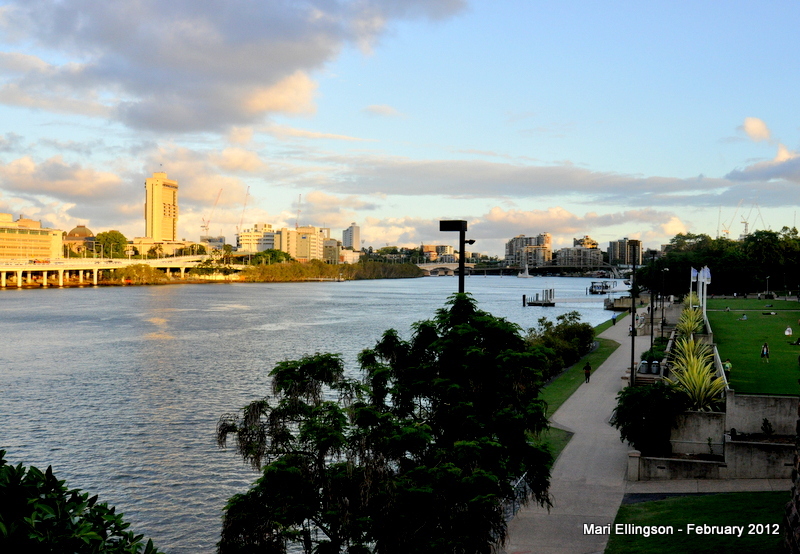 Some views on the wokabaut before I made for my hotel in Toowong, upriver from the City. Watching an artist at work at the start of the Queen Street Mall. 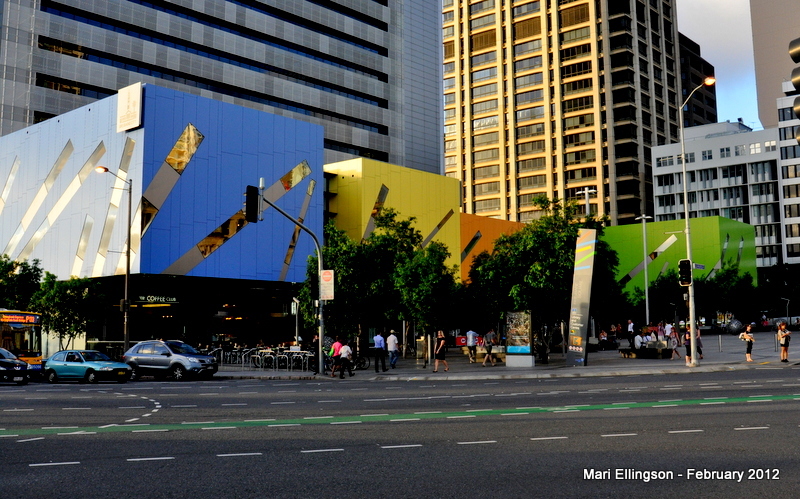 The many pieces of artwork displayed around the City. Crossing over the bridge back to South Bank. So peaceful. Looking back towards the City - in the foreground is the The Treasury building - and no, it is not a government building but you may run into a few public servants! View from the walkway leading down to the jetty to catch the City Cat to Toowong. My Friday afternoon wokabaut was too short but long enough to celebrate TGIF. 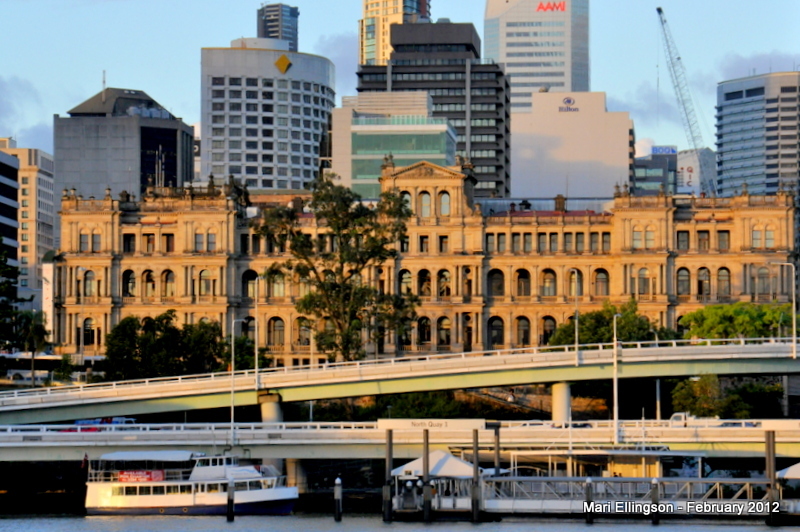 I’ve been to Brisbane City many times in the past but on this particular trip I did a combination of things which added to my knowledge about the city and its attractions. Travelling up and down the river was something new. 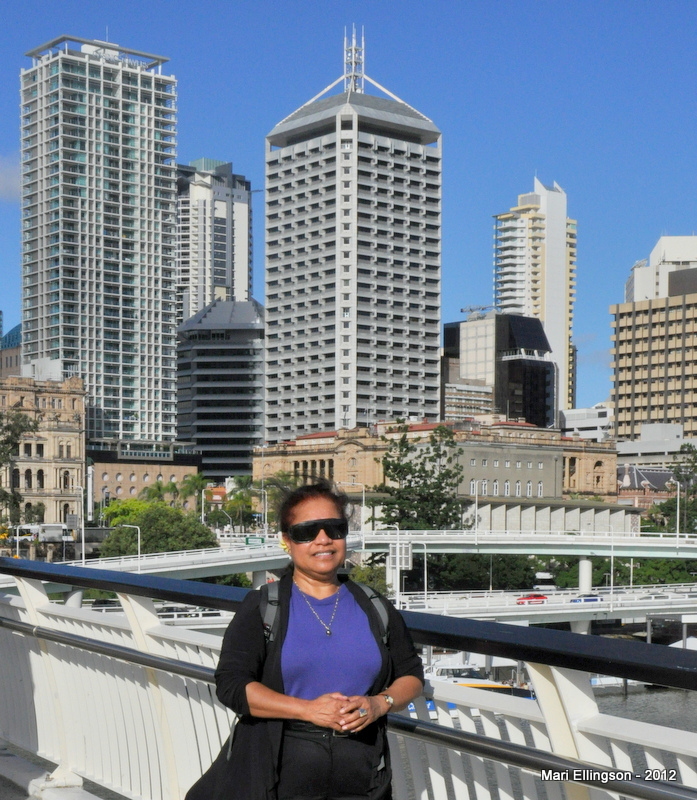 Just as walking across one of the many bridges over the Brisbane River with a camera, window-shopping around Queen Street Mall, getting fresh fruit juice, the rock n’ roll dancing and so on. 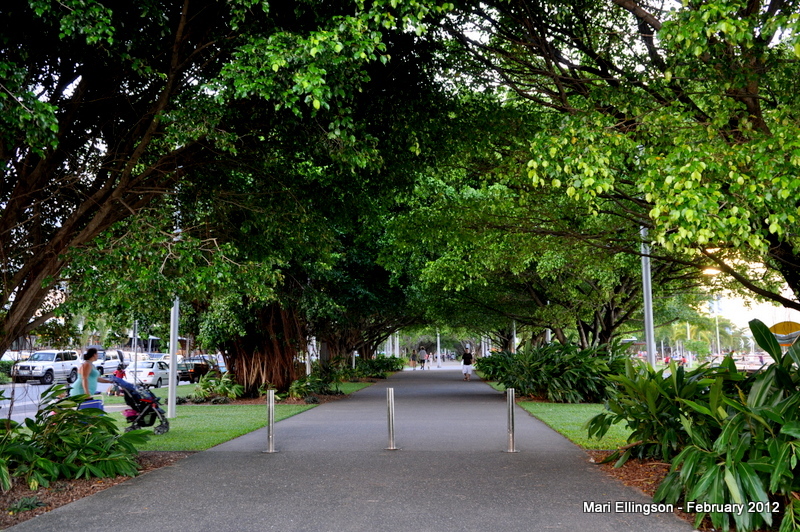 I was not in a tearing hurry to go anywhere except back to my hotel in Toowong. 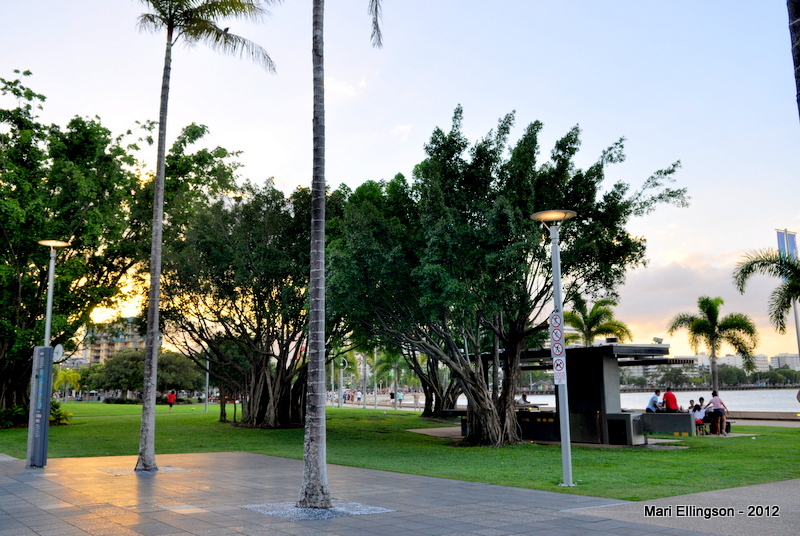 I guess armed with a DSLR digital camera puts Brisbane City in a different light for me. How many more did I miss out on this walk? Perhaps next time a night time wokabaut may be the new thing to do. 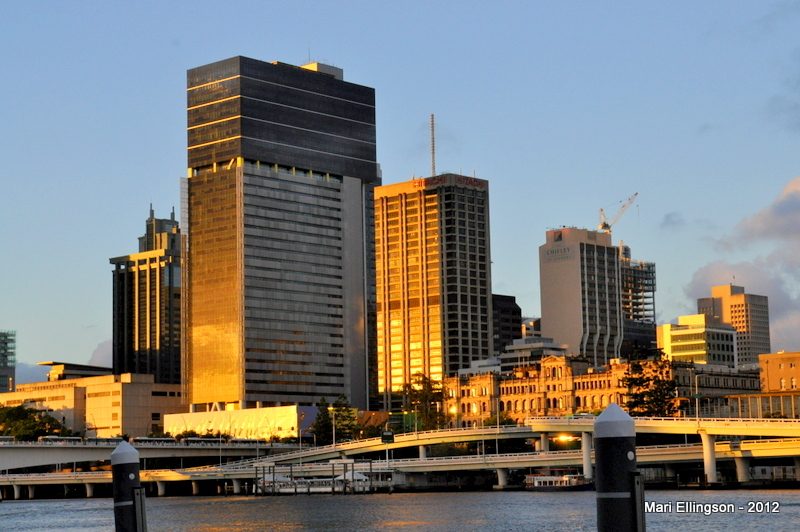 The City skyline at sunset. Breathtaking! 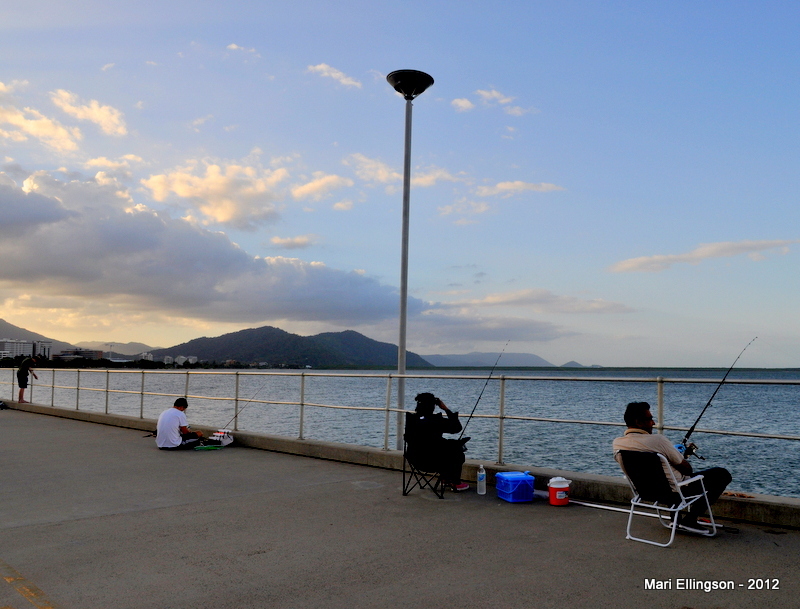 Looking across from South Bank 2 jetty whilst waiting for the City Cat.